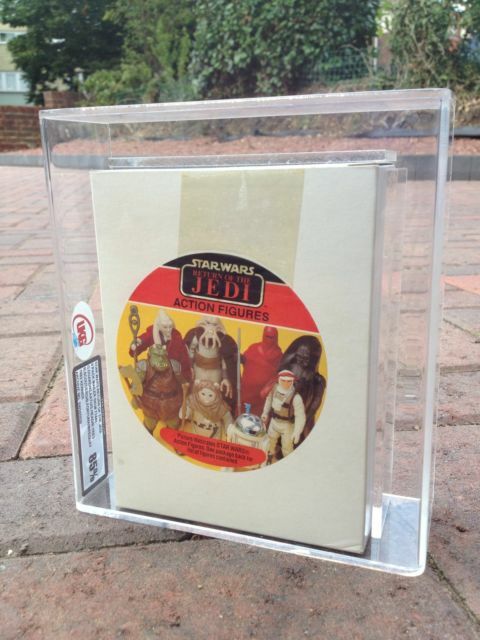 Welcome to the second edition of the end of Summer Round up, this installment focusing on Return of the Jedi. 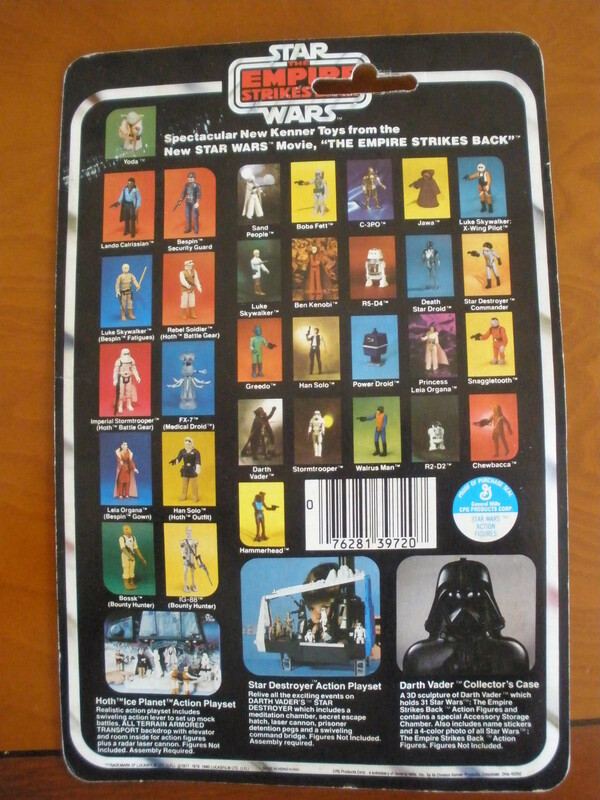 Though we haven’t kept up with our original plans for the schedule we’re still trying to get these published as close as we can. 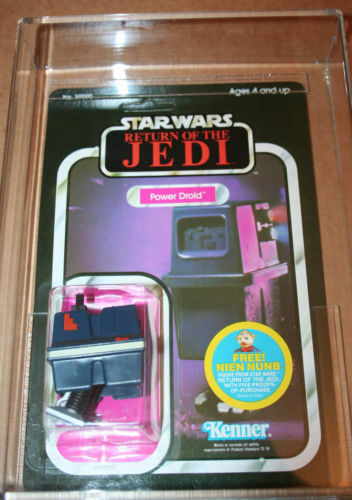 Tough, tough, tough topic, when you talk about scope there’s nothing more difficult than trying to pull together a comprehensive review of the Return of the Jedi toy line. 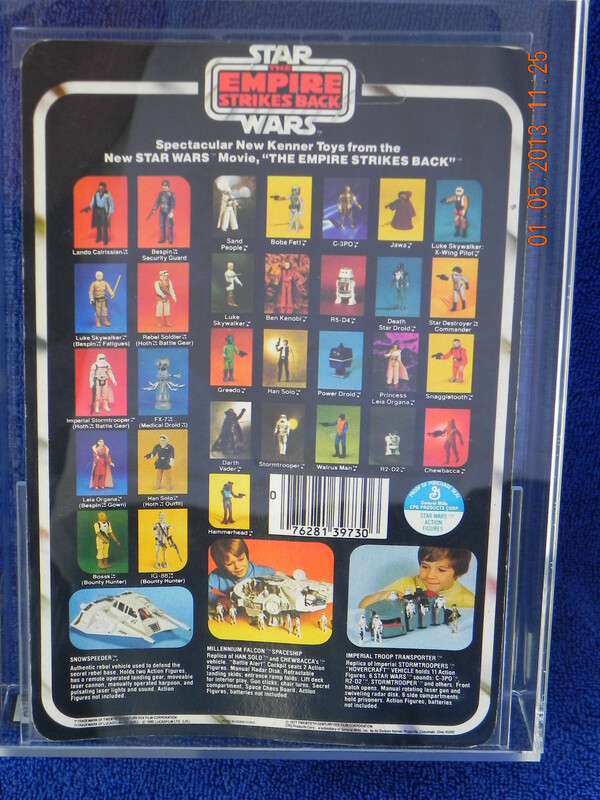 Let’s just cover the basic numbers, 90 MOC versions including variants (with 4 main backers 48, 65, 77 and 79), 30+ Boxed Items Play sets-Vehicles-Creatures-Mini Rigs-Large Toys, 4 Mailers, 26 Catalog Multipacks, 100+ versions of 2 Packs, the Plush Series, not to mention the 50 figure proofs and several large proofs released for the Revenge series. 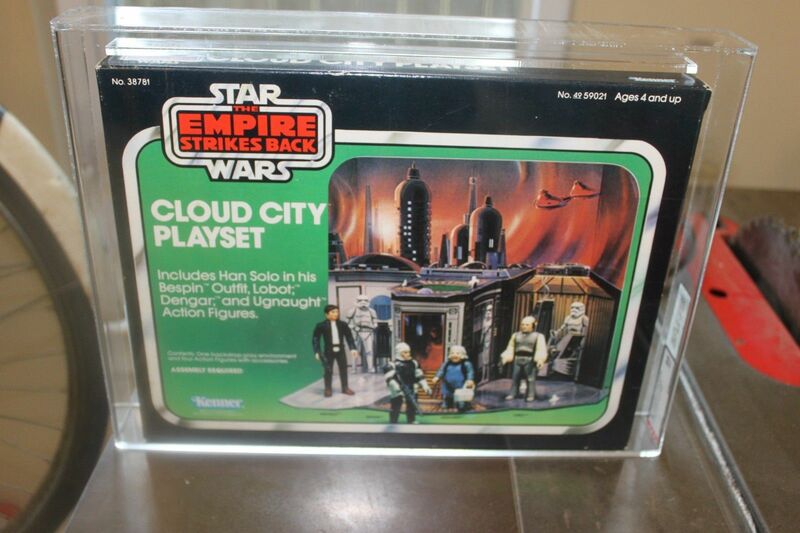 However we didn’t see a few things in this release that we did with Empire or Star Wars. 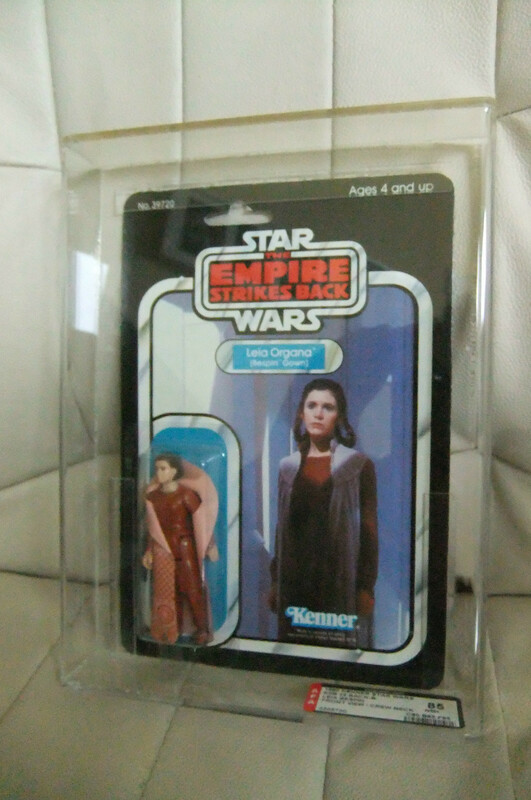 The 12” Large Format figures we’re never tried out in the market, nor were the-Packs continued, additionally nothing was produced from a die-cast perspective. 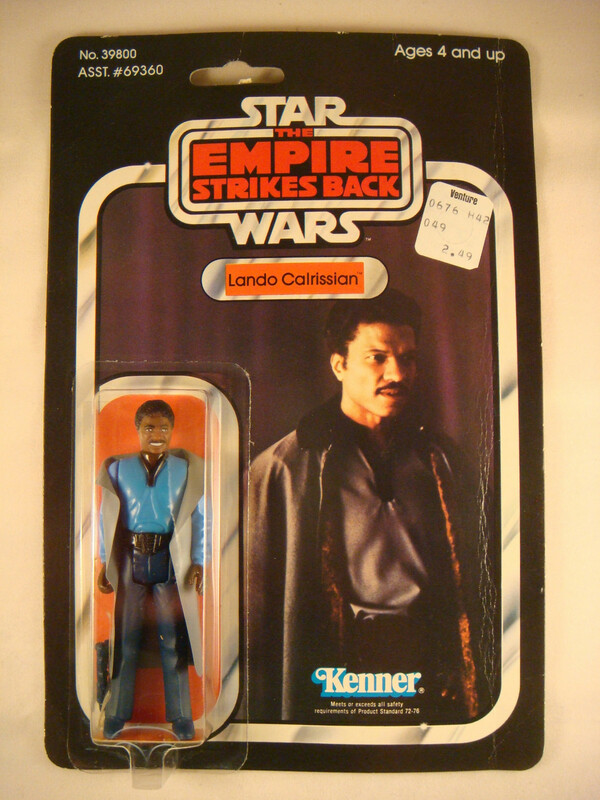 Still the breadth of this line makes it difficult to be comprehensive. 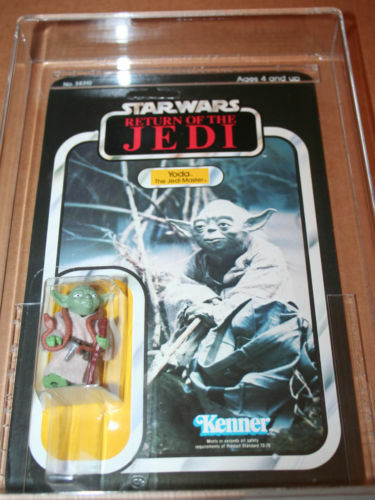 There is a reason that very few toy lines were progressive like the Kenner Vintage Star Wars series, and I don’t define progressive as anything to do with it being a ground breaking line, rather I mean it was one of the few toy lines to produce toys for the previous movie’s figures during a sequel’s toy run, and in this case build to the collect all 79 motif. 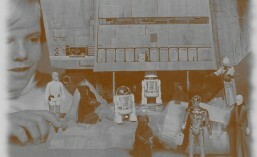 It’s expensive to maintain, there usually is a rate of diminishing returns, and overall it’s just not the best business decision if you’re trying to achieve scale or efficiencies. 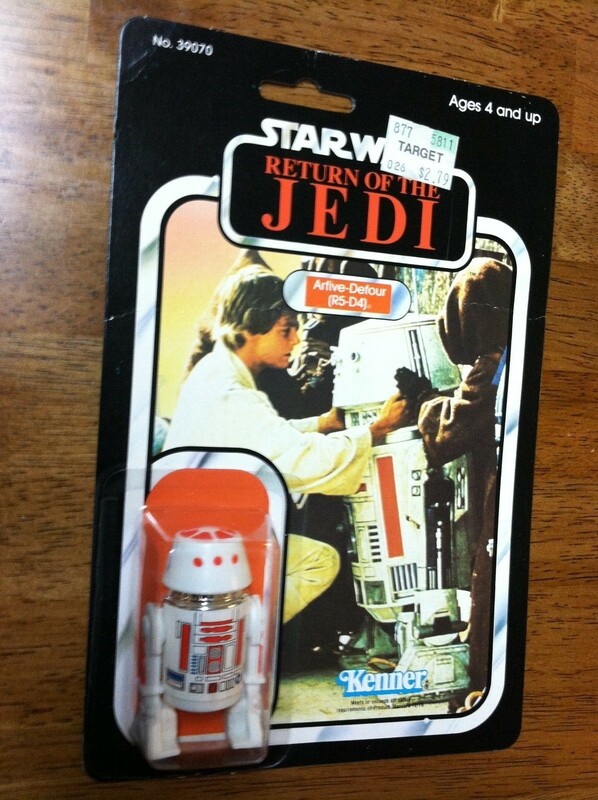 That’s why you don’t see this strategy carried out in many lines today. 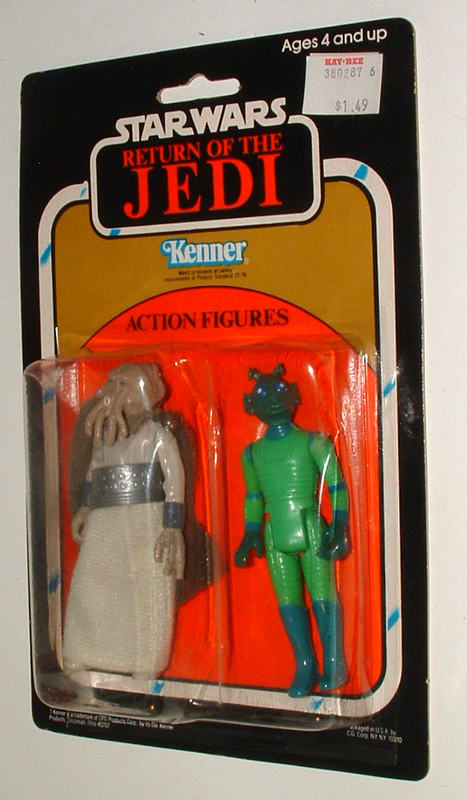 The only place to start with this post is the genesis of the line; that being the Revenge of the Jedi pre-production items. 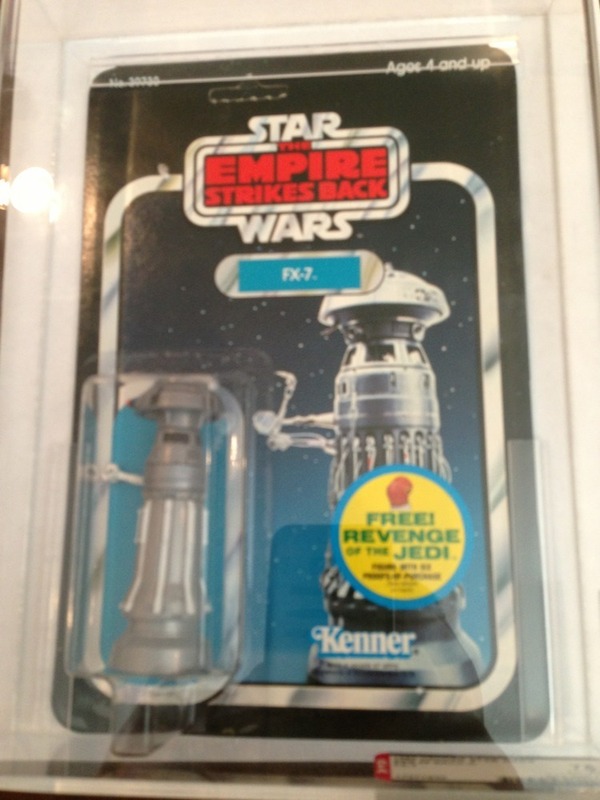 With some strong availability and wide breadth the Revenge of the Jedi proofs are a favorite of many collectors. 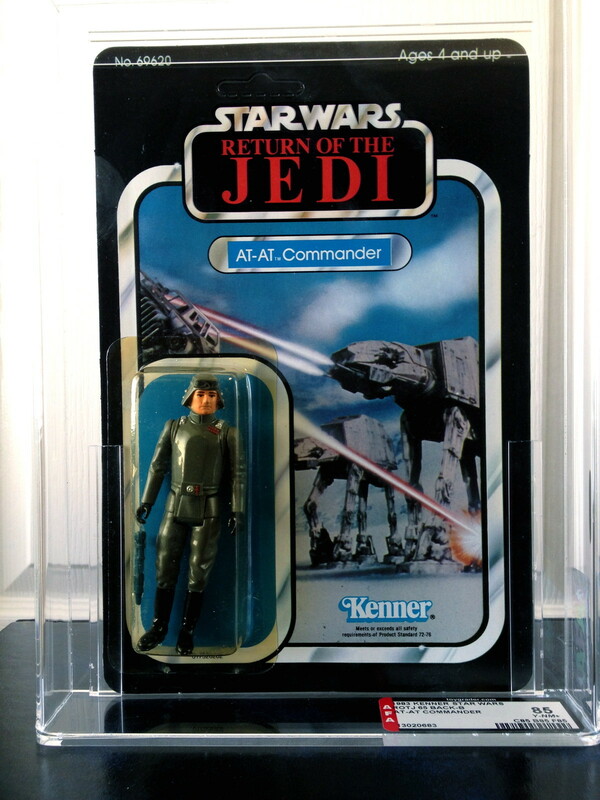 Given that we ran through an entire review of a large lot of proofs we’ll just reference the massive collection that was up for auction this past year, via our earlier post seen here February MarketWatch – General. 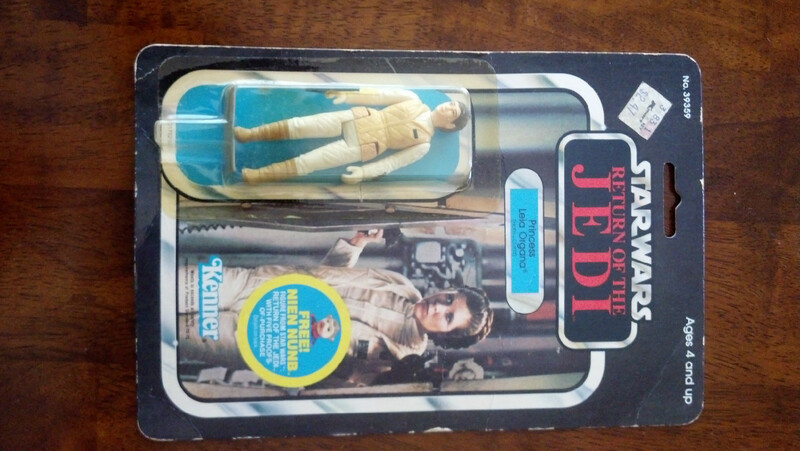 The ROTJ series was packed with a plethora of items, and to kick things off we’ll take a look at all things cardboard with 8 corners. 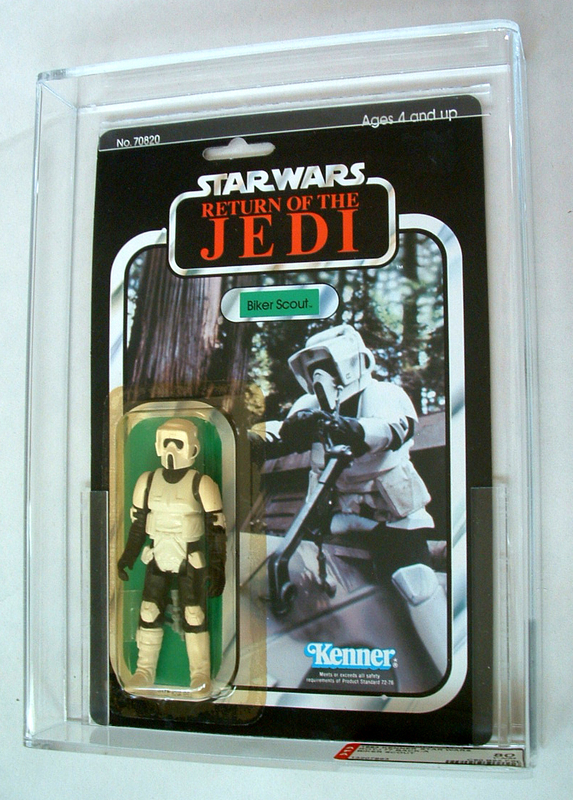 The boxed items, specifically vehicles, play sets and other figure related item are a major part of the ROTJ release. 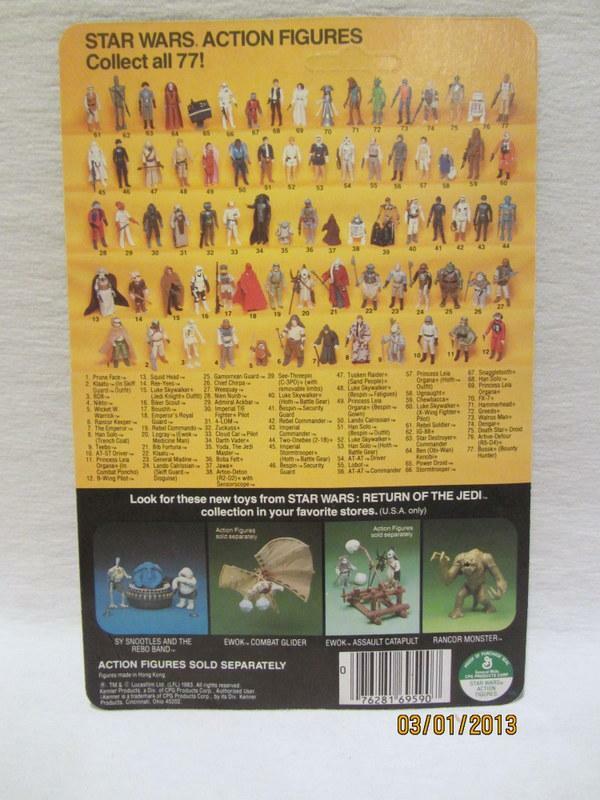 There was a wide diversification of items released with the Return of the Jedi series, you had the continuation of some staples, like the Falcon, and X-Wing, the reintroduction to a few Star Wars era items via the Collectors series, and of course a slew of unique items to the period to reflect Jabba’s Palace to the Ewok Village. 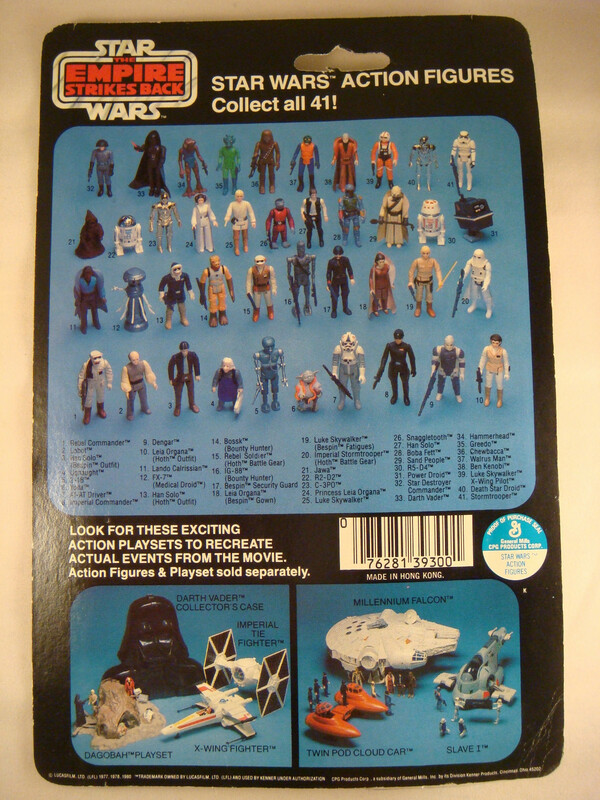 Suffice it to say this particular release had a lot to choose from, depending on which planet you wanted to recreate in your basement or backyard. 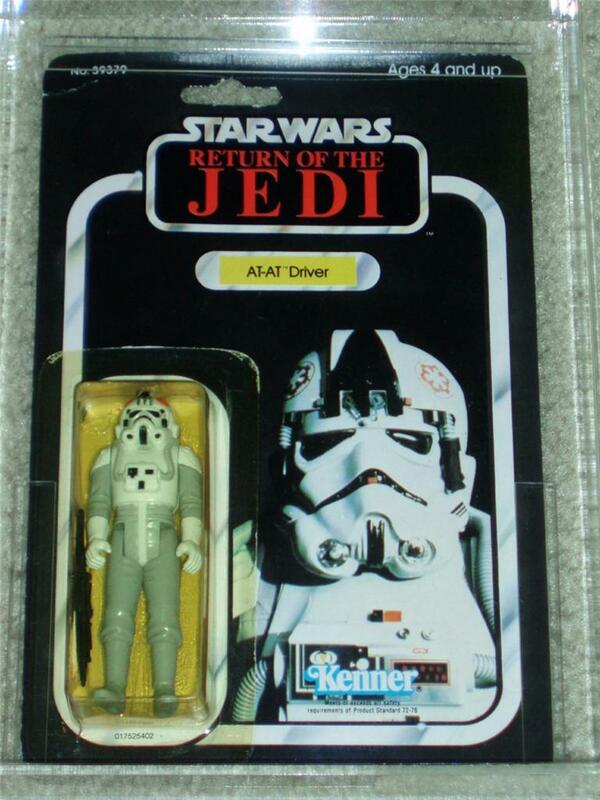 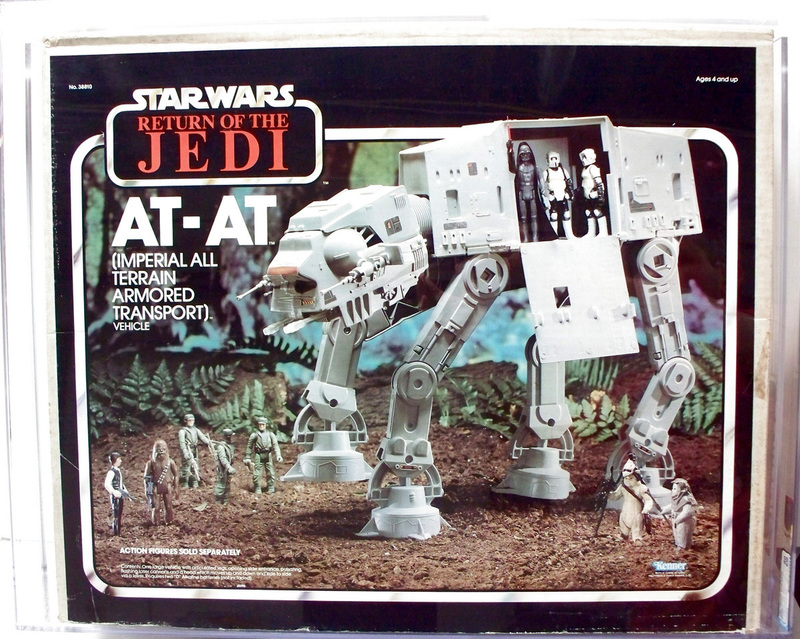 One of the most iconic toys in the series was the AT AT, it appears for only a brief second in ROTJ however due to the popularity in the ESB line they continued this sku into the series for a short run. 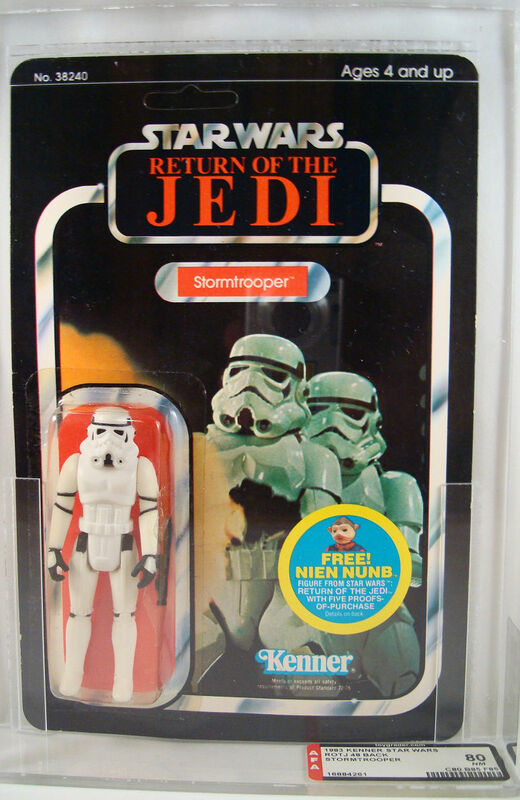 More rare then it’s ESB counterpart the ROTJ box is a love it or hate situation, most fans are still more apt to go after the traditional Hoth version, but some collectors swear that the ROTJ version is one of the best. 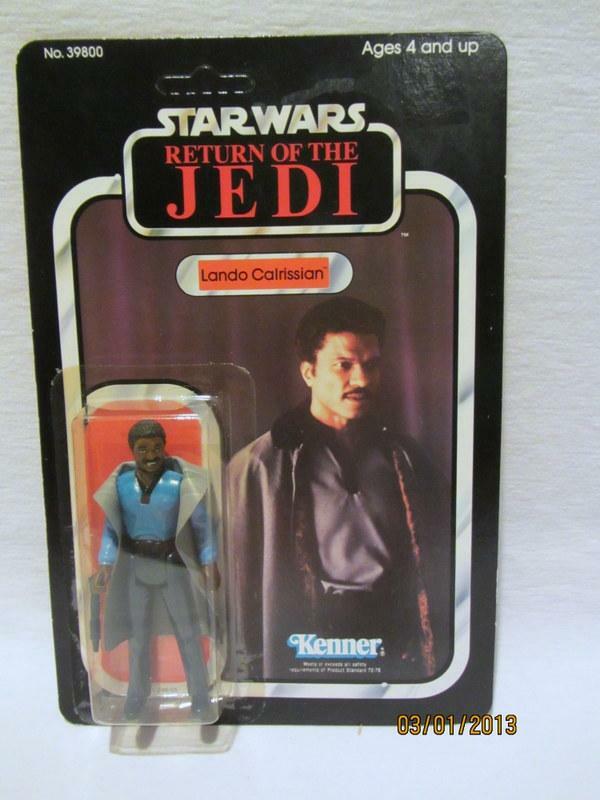 There’s not a lot of lukewarm feelings here, no pun intended. 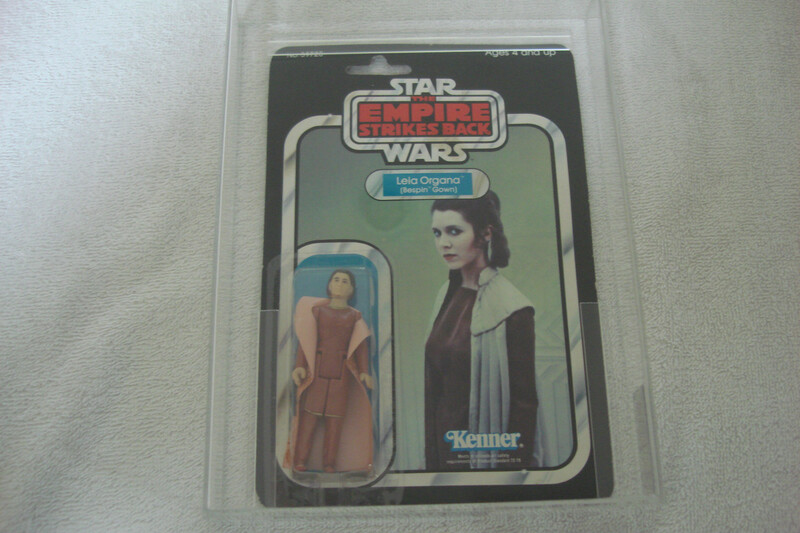 Here we have a Q graded item that went for market value. 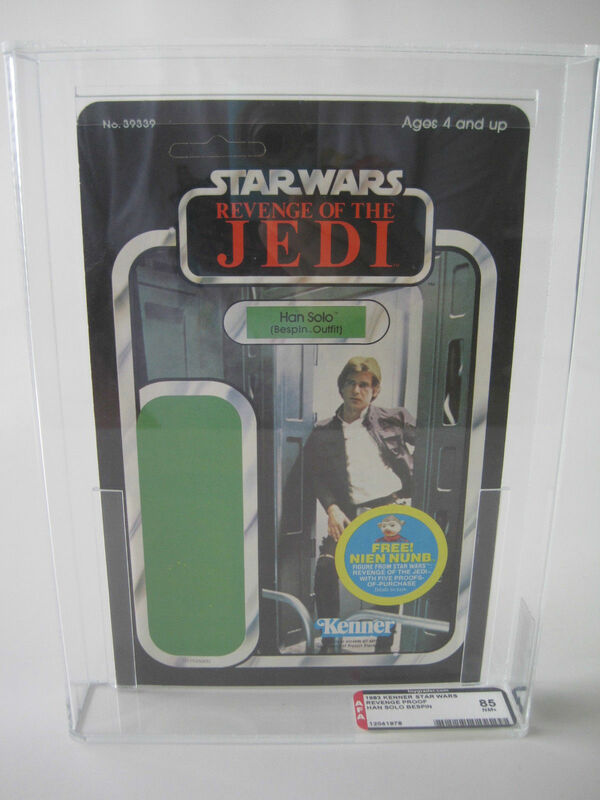 Although a MISB ROTJ At At pulls in on average $1000-1500, this is a great alternative for someone who still wants that museum look without having to drop as much cash. 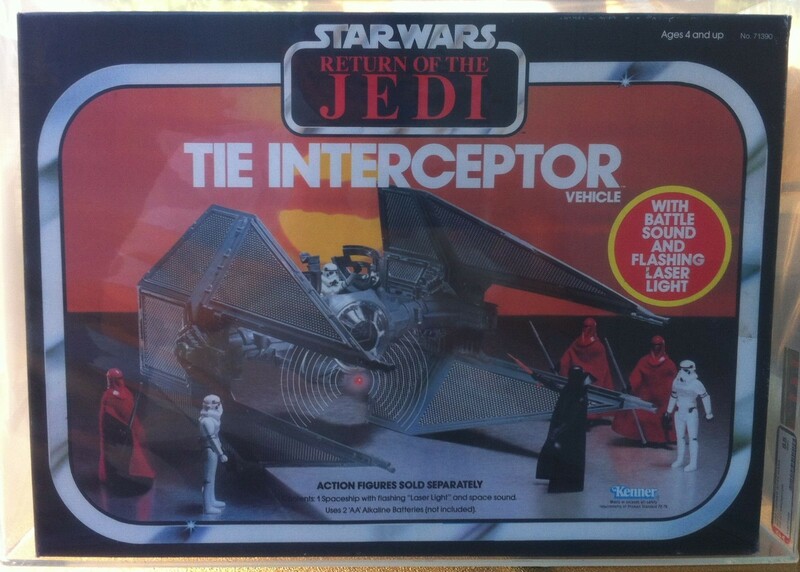 Tie Interceptor $450 – ROTJ Tie Interceptor MISB One of the few new “Vehicles” for ROTJ and one of the coolest in the series the Tie Interceptor finished off the three movie run for the Tie series of vehicles. 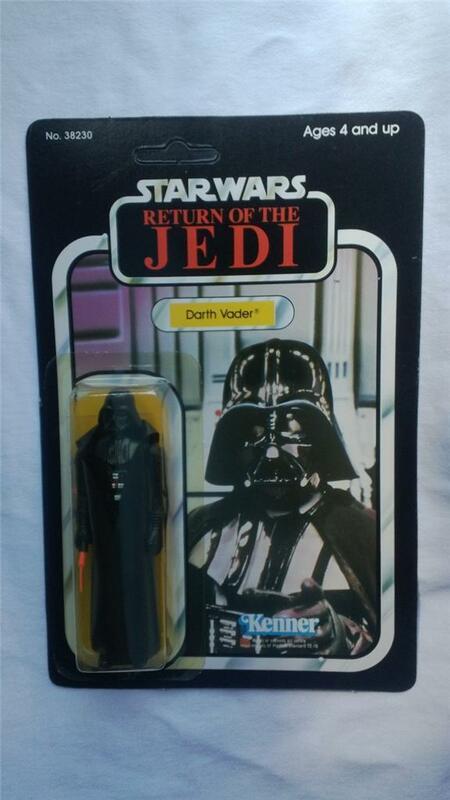 In this case we have a good price for a really nice item, but right inline with Market Value. 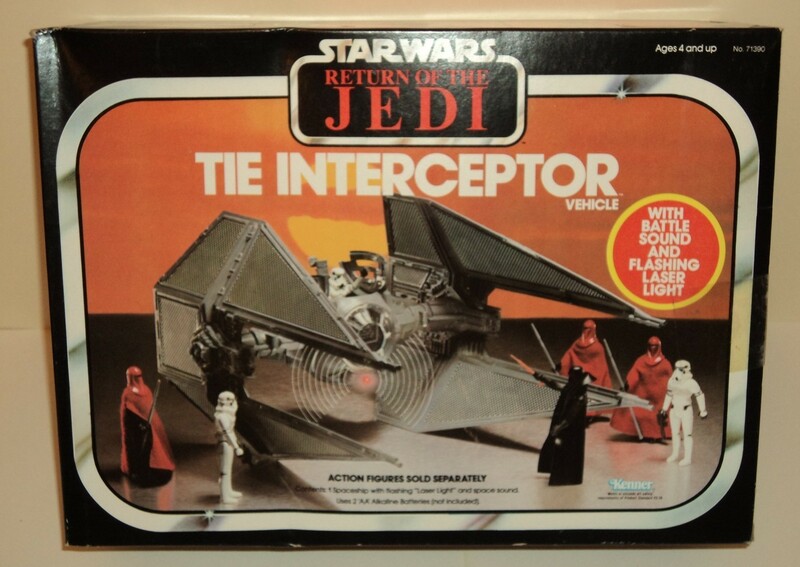 Tie Interceptor – $675 – AFA85 – Tie Interceptor Moving on we have a graded version of the item, with a grade of 85 this was right in line with market value, and maybe even a bit low in comparison to some historical auctions. 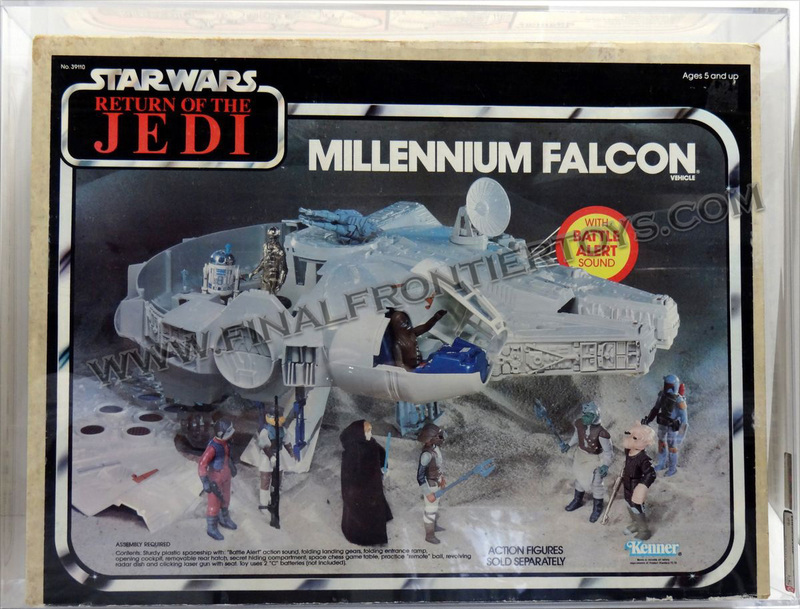 ROTJ Millennium Falcon – $1500ish – AFA 80 – ROTJ Falcon AFA 80 Our second re-released item from the Vehicle line up is the Falcon. 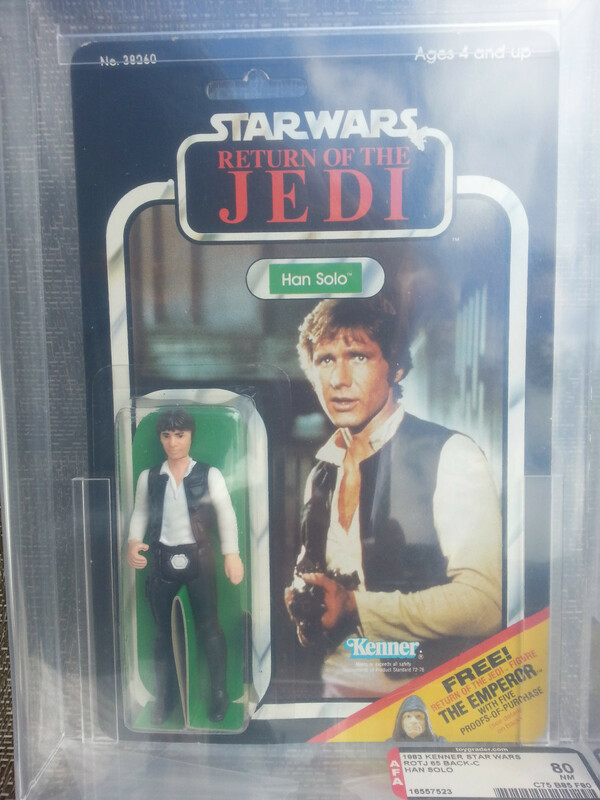 This is the 3rd version of the Falcon to be released from an artwork perspective. 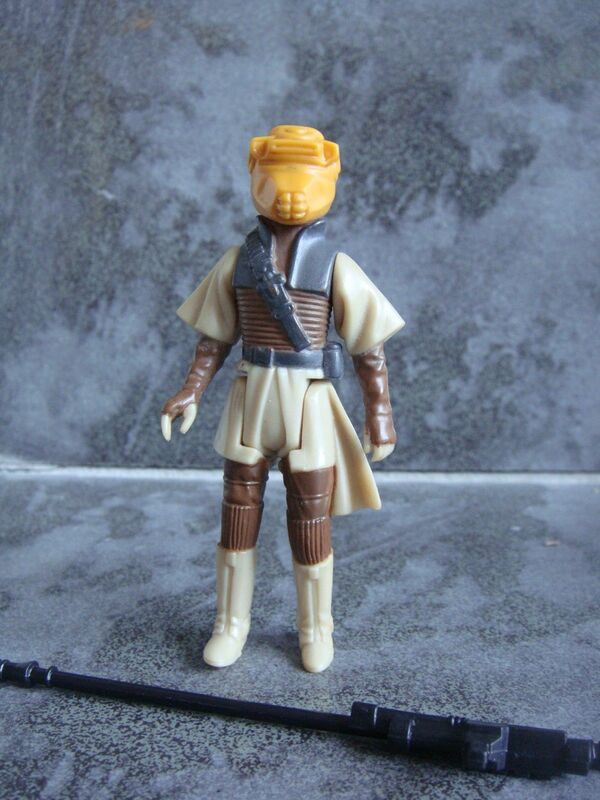 Showcasing the unreleased sandstorm scene from ROTJ, this lasts as one of my personal favorites pieces of artwork in the Star Wars toy line. 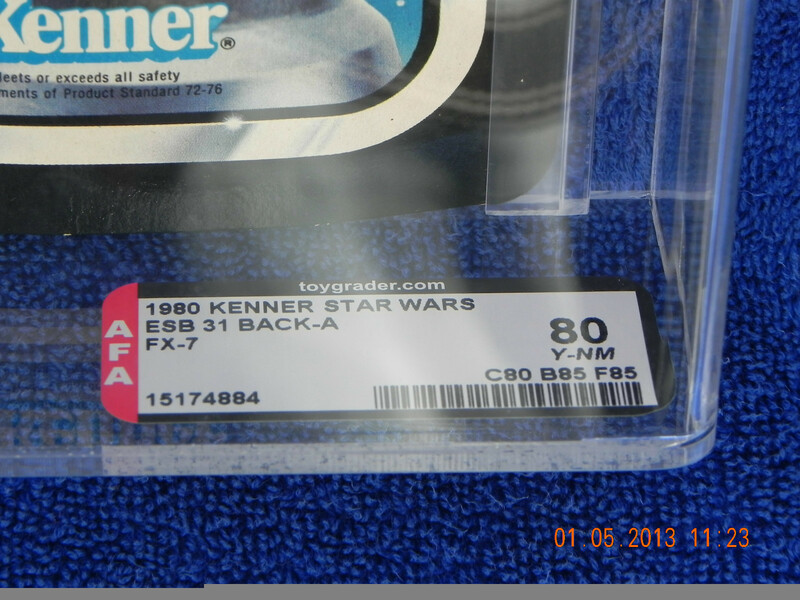 A great item and a fairly high price given AFA80 examples tend to draw closer to the $1000-1200 mark. 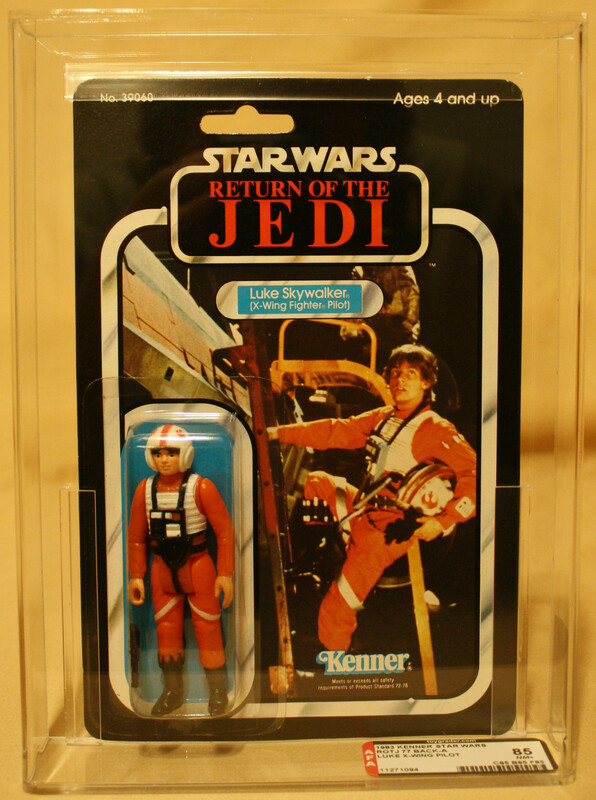 ROTJ X-Wing – $899 –AFA80 – ROTJ X-Wing The last of the vehicles covered this month could be the most surprising from a price perspective. 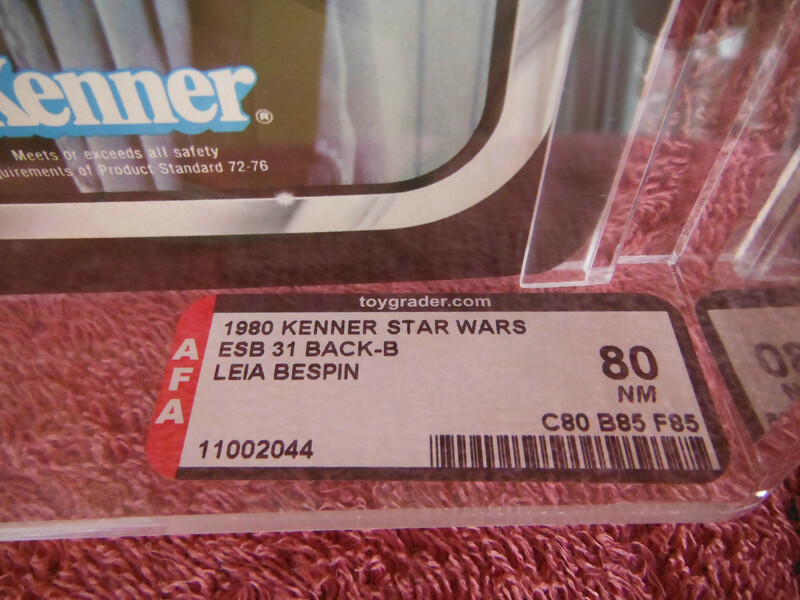 Here we find an AFA80 X-Wing Fighter – Battle Damaged, with a price tag of $899. 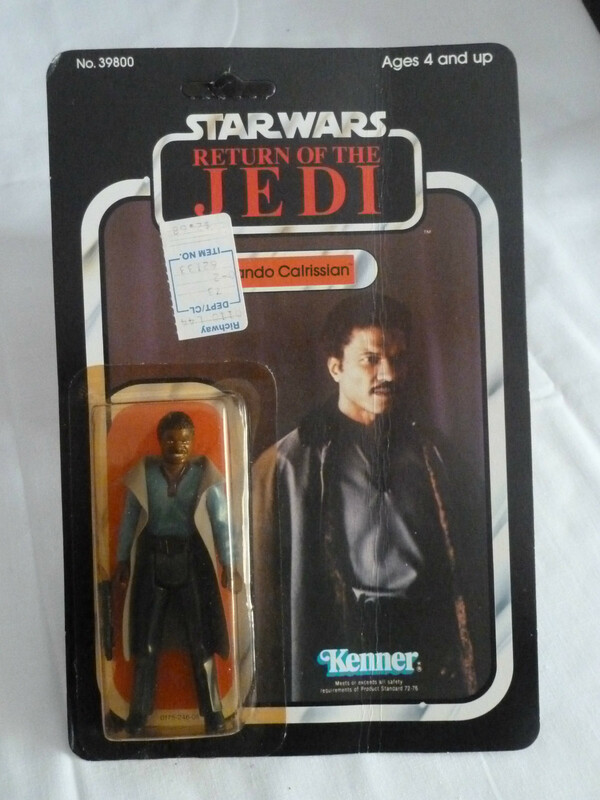 Even though we see a hefty price tag it’s actually on par for this particular piece. 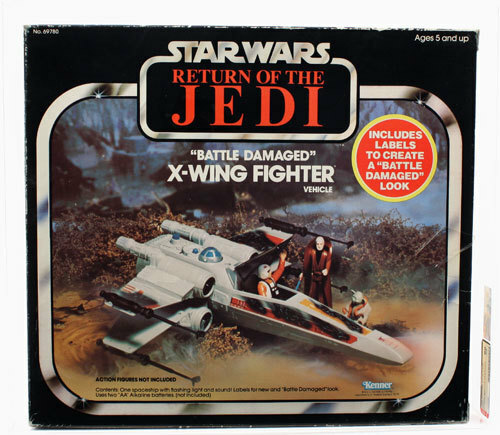 For some reason the X-Wing remains in short supply in comparison to most of the other items in the release, the same can be said to some extent for the Battle Damaged Tie Fighter. 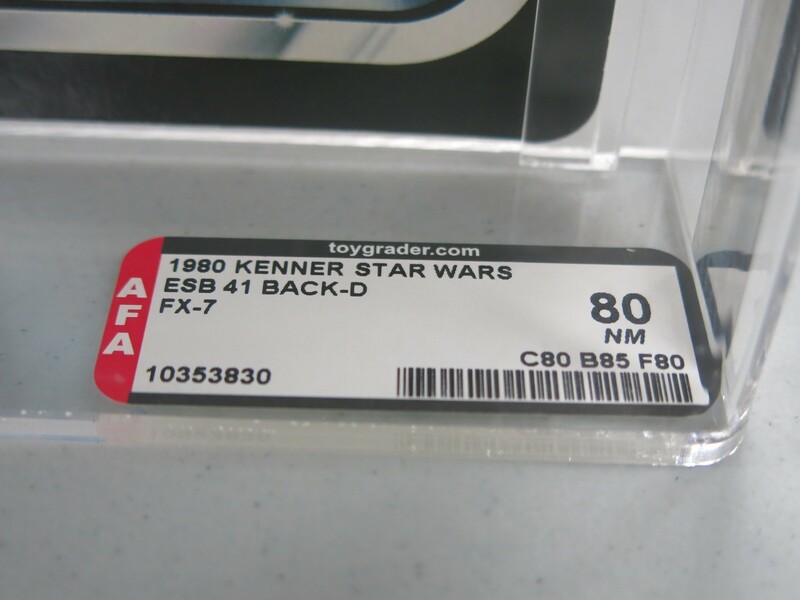 There are only a handful of examples 80 and up to date, in the case of the X-Wing, the AFA75 is truly the AFA80 as it seems to be the fat middle of the grading band. 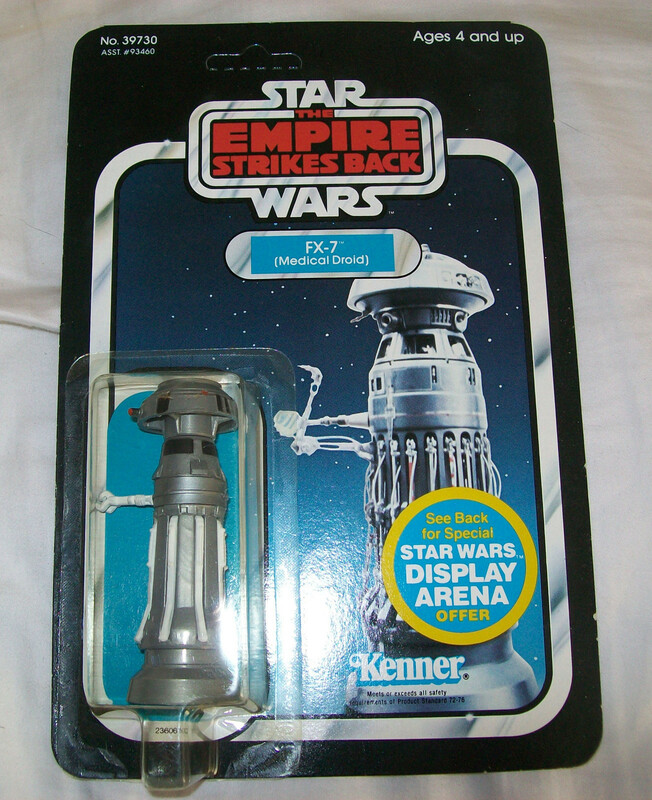 A very cool piece and something we may not see in this condition again. 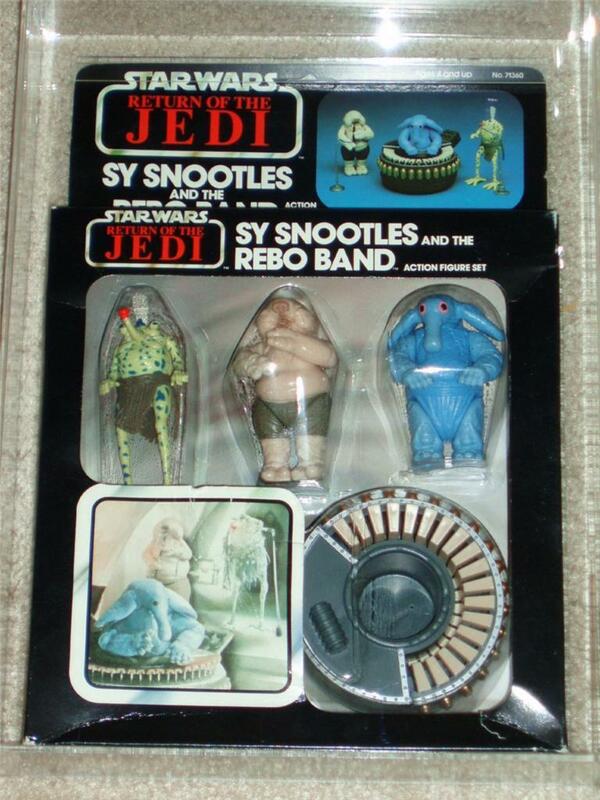 Sy Snootles and the Rebo Band MISB – AFA75 – $324 – Sy Snootles and the Rebo Band A fan favorite the Rebo Band set it one of the best items from the ROTJ release. 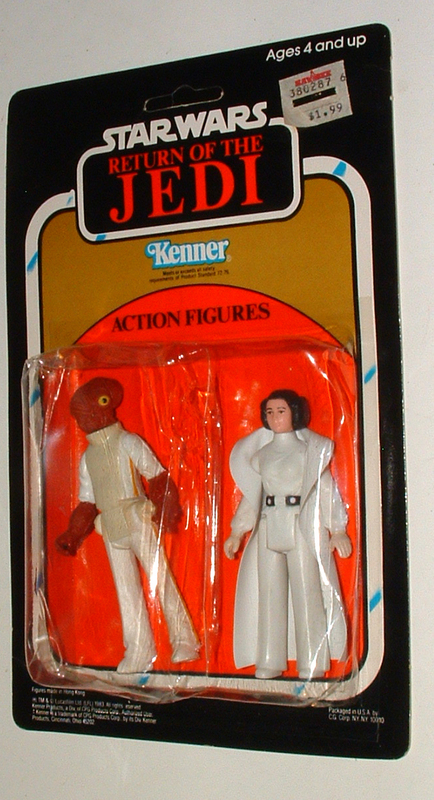 Two versions were made with variations on the instruments/microphone stands. 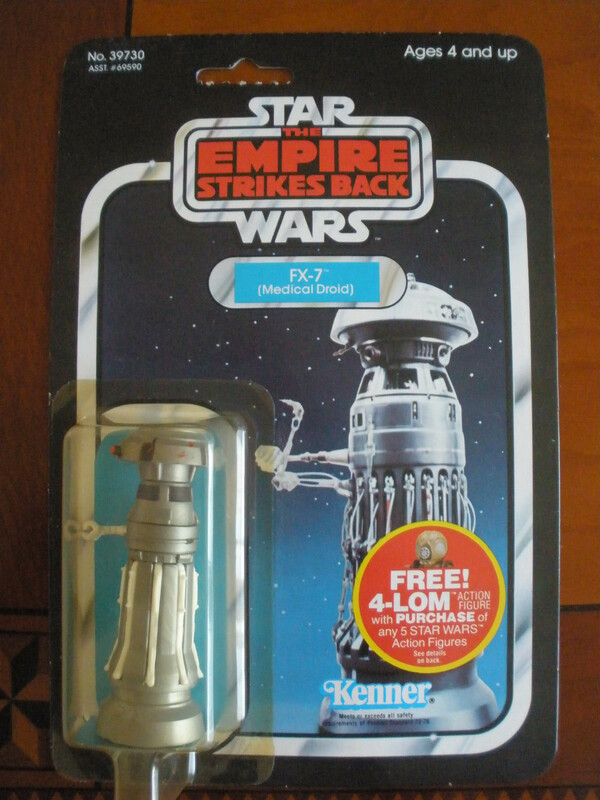 Here we have the more common version with silver microphones and a black flute. 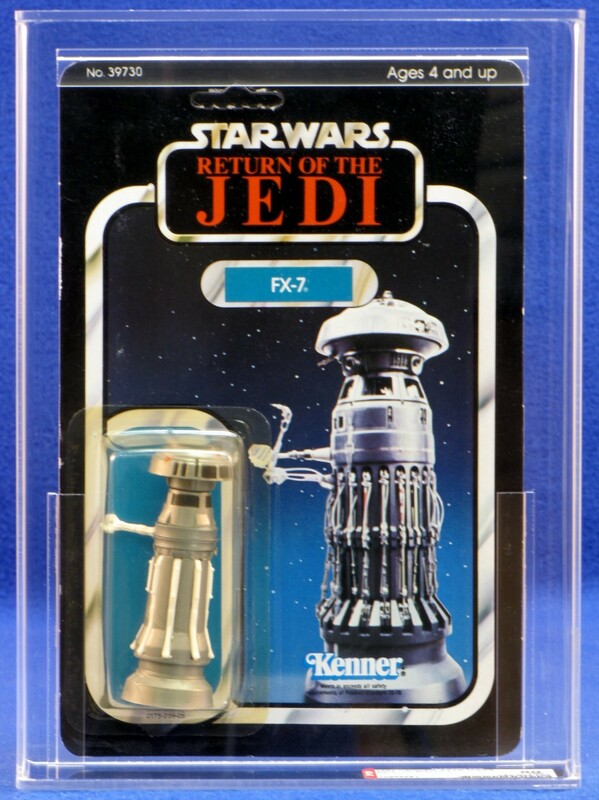 In very good condition (AFA 75) this item did drive a good price for either side as it’s right on par with recent auctions. 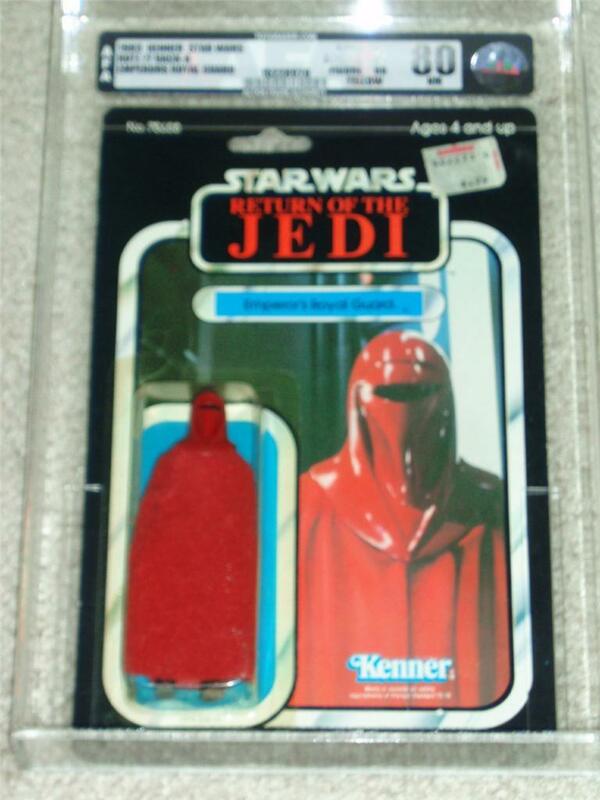 I chose this one in particular as it also had a clear bubble, which is really important on this item if you want to see the artwork that is used in the backdrop of the figures. 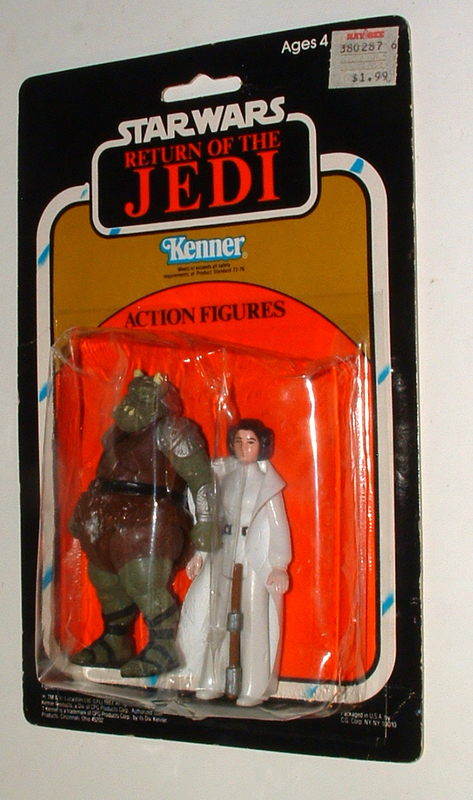 Jabba the Hutt – $395 – AFA80 – Jabba the Hutt AFA 80 One of the more popular characters in the movie came to the toy line in a very unique way, via a play set vs. a cardback. 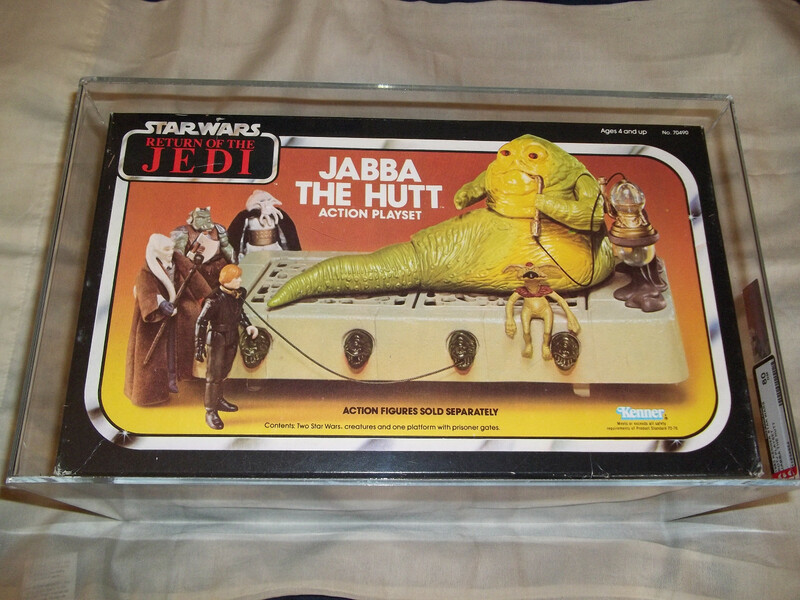 The Jabba the Hutt play set is a well-made replication of the scene from Return of the Jedi. 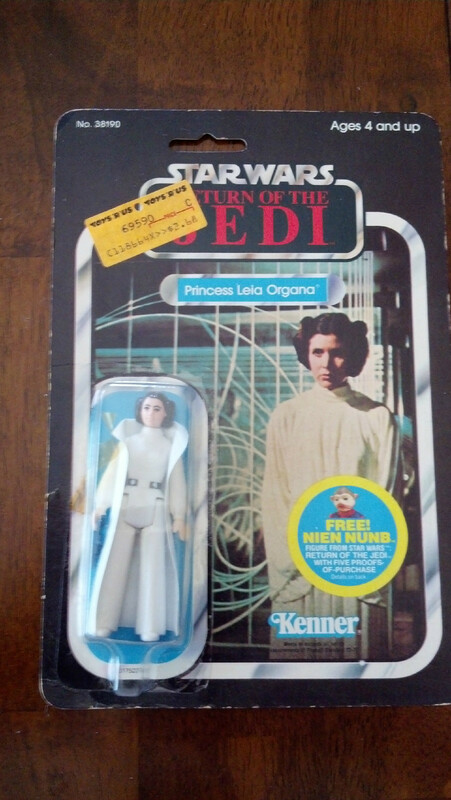 This version was priced a bit high, and didn’t get any interest from the collecting community. 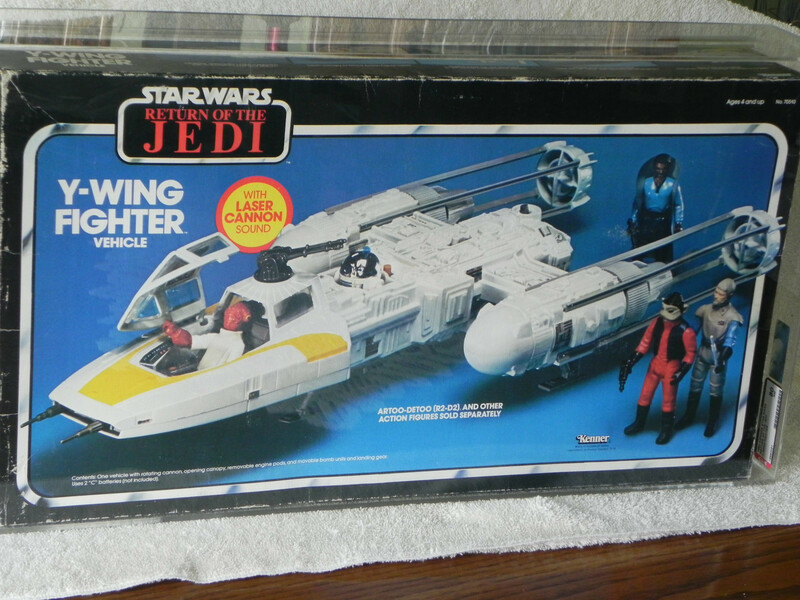 Still a very nice example and easily a $300 item in this condition. 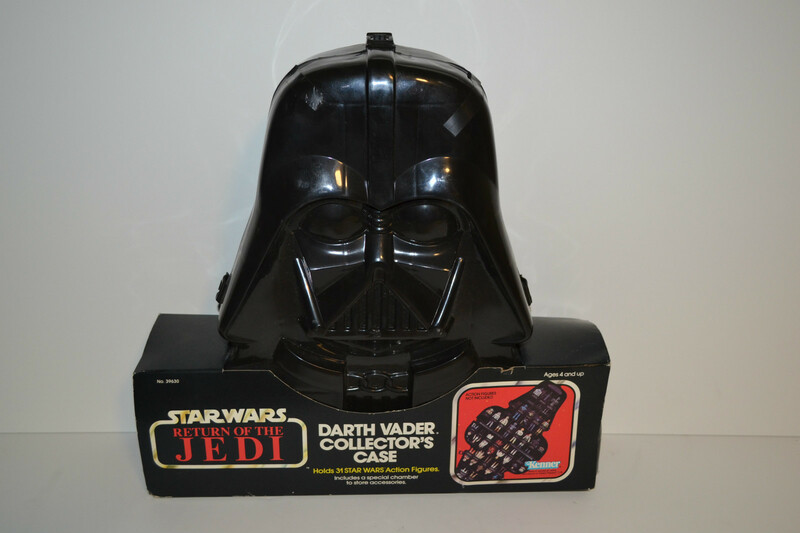 Darth Vader Case – $139.50 ROTJ Darth Vader Figure Case MISB The Darth Vader Case was such a staple of the ESB line and to this day is instantly recognizable by the general populous that it was no surprise to see it show up in the ROTJ release. 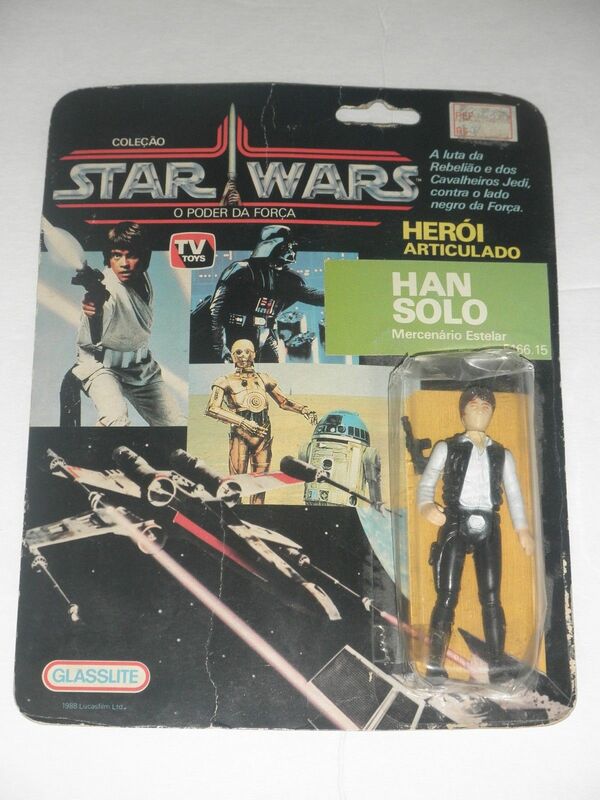 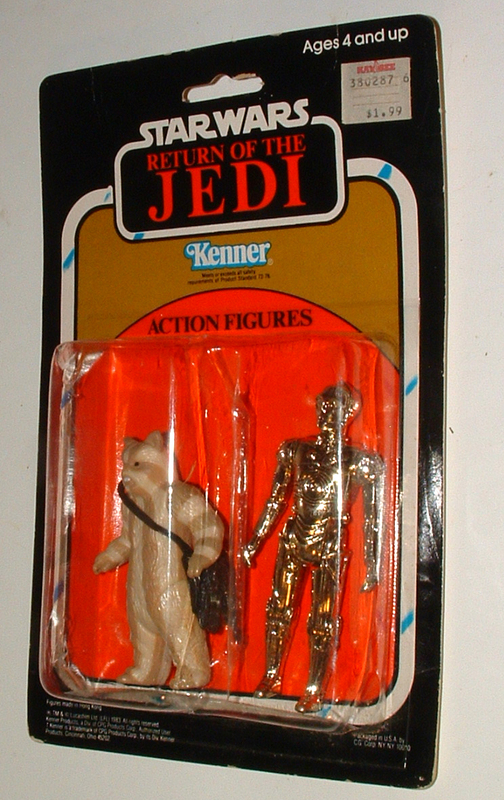 Although this was a short lived run for the item, due to the C-3PO Case. 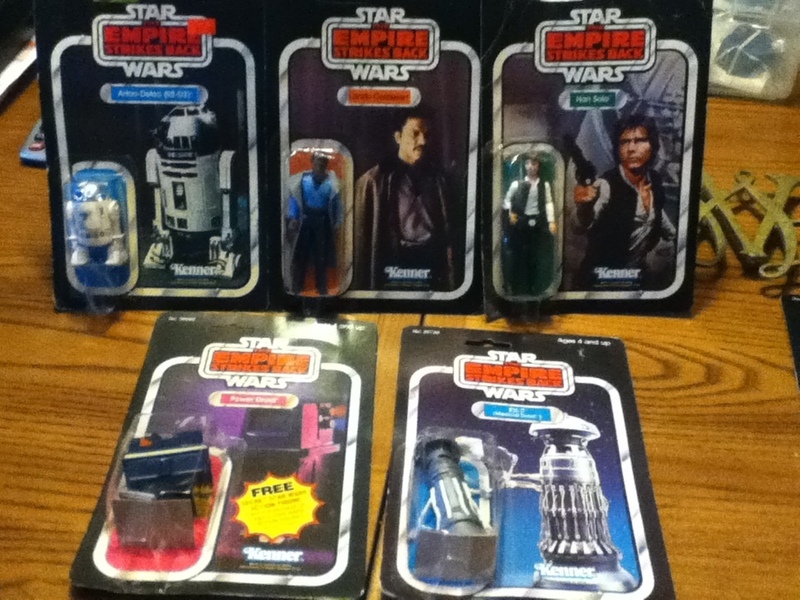 Several made it through in sealed packages. 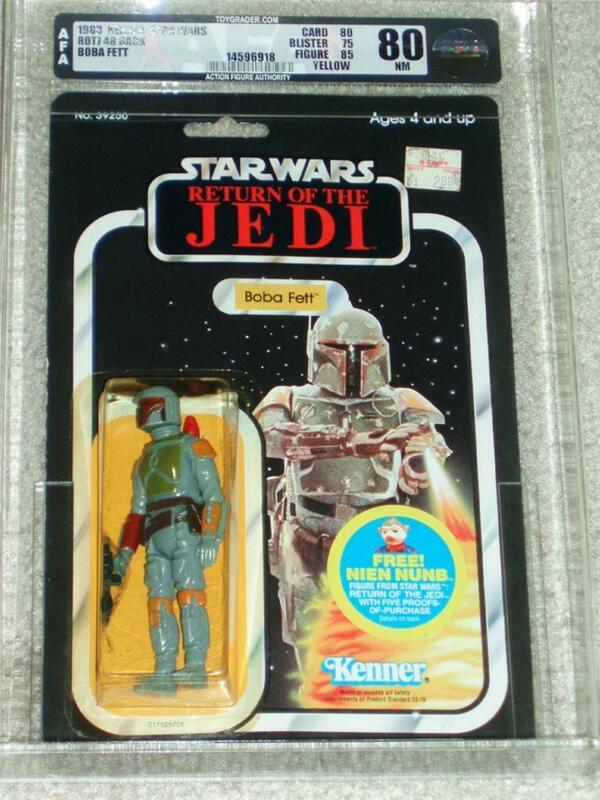 Here we have a very nice example with a price that’s right on for the quality. 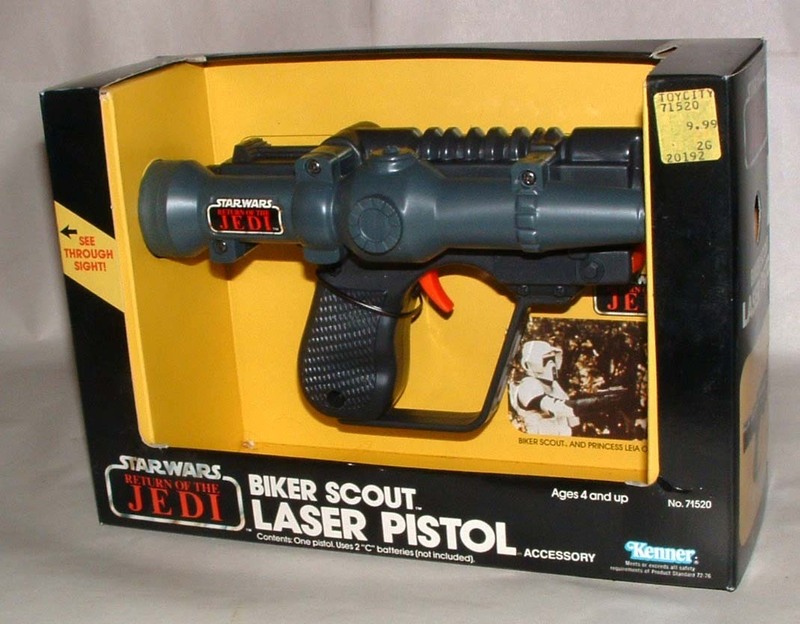 Scout Pistol – $180 – C8 – Scout Pistol MISB The Scout Pistol was another spot on replication from the movie, along the with Green Lightsaber it was the only new large scale toy for ROTJ, as all other items from the era were released in previous toy lines. 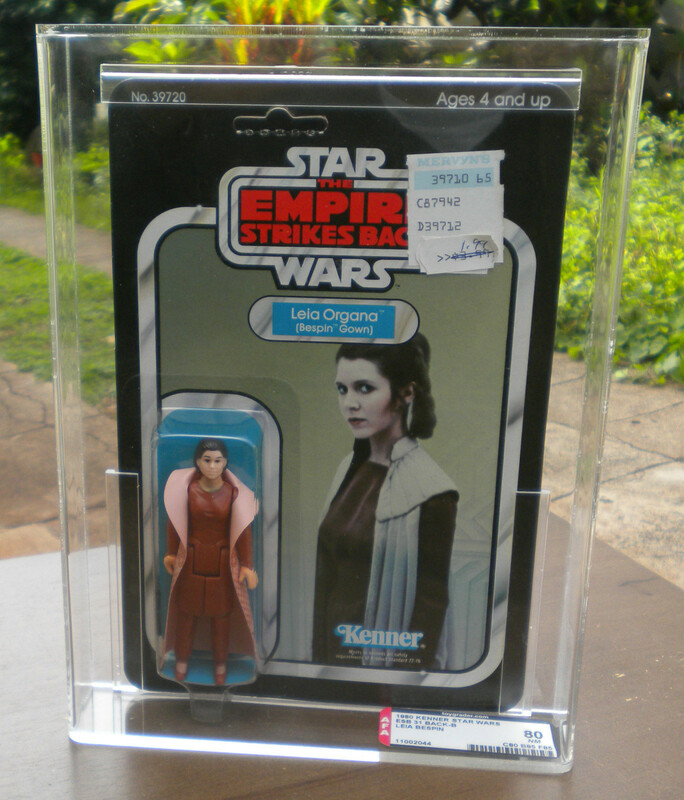 Here we have a great example for a good price as these seem to average around $200 sealed. 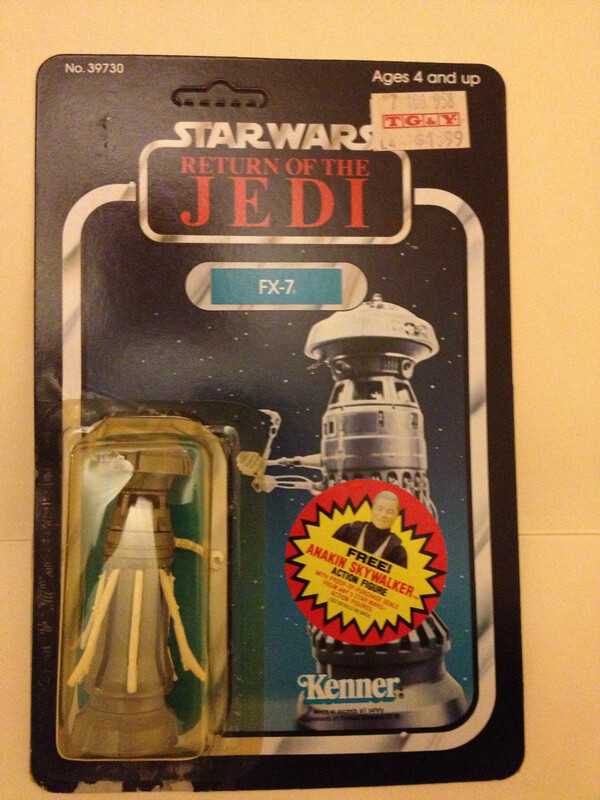 ROTJ Lightsaber Green AFA80 – $450 Est – ROTJ Force Lightsaber AFA80 Green Here we have a great MISB graded example of an item we discussed a few months back. 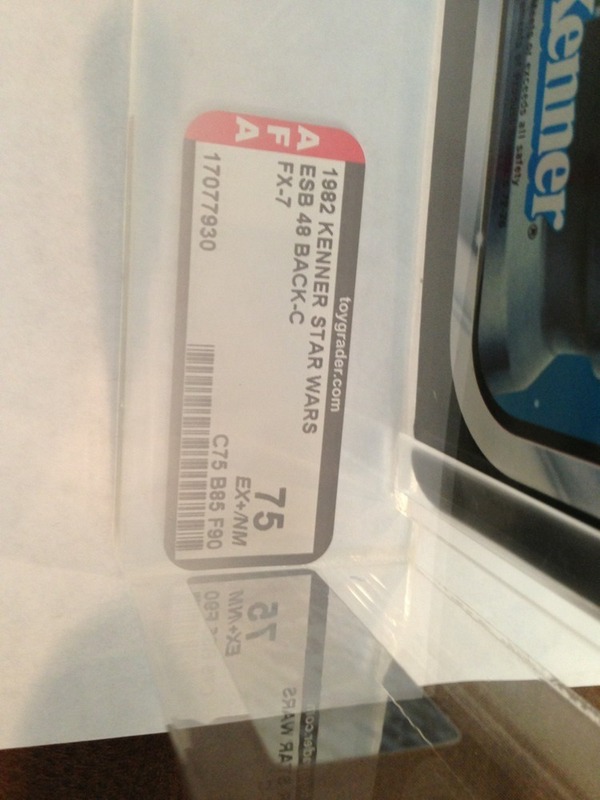 The Force Lightsaber example we see here went for a strong price, the grading alone would run about $150, and there are only a few Green graded examples out here. 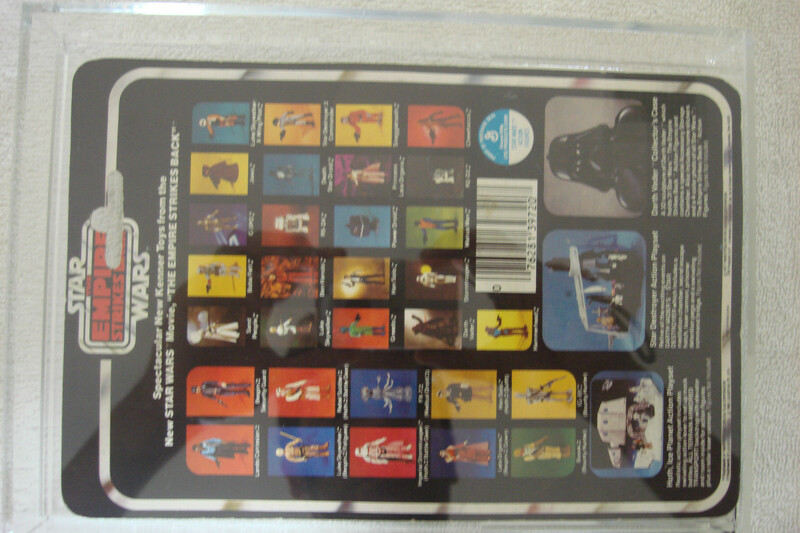 Mailers – Standard and Multi Pack 8-Pack Catalog Mailer – Open with sealed bags – $382 – 8 Pack Catalog Mailer As mentioned in the intro there were 26 catalog mailers to be released in conjunction with the ROTJ toy line. 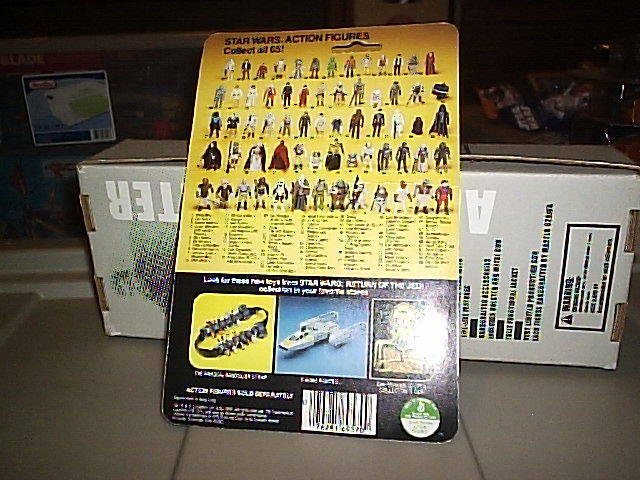 Here we have one of the few large 8-Packs containing a great selection of characters across a few movies. 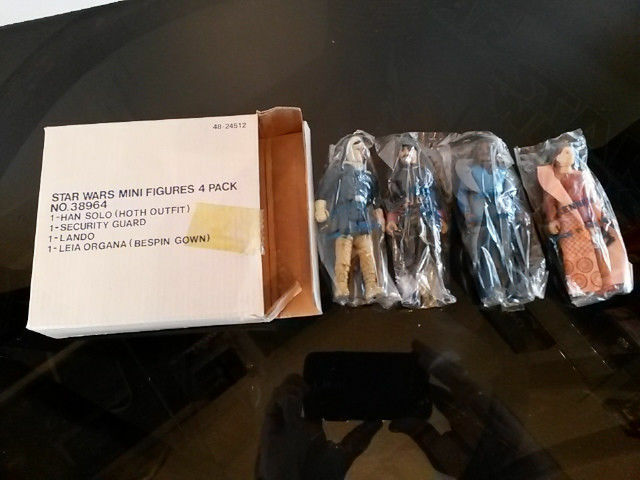 An average price for something in great condition overall, a really nice grab for someone. 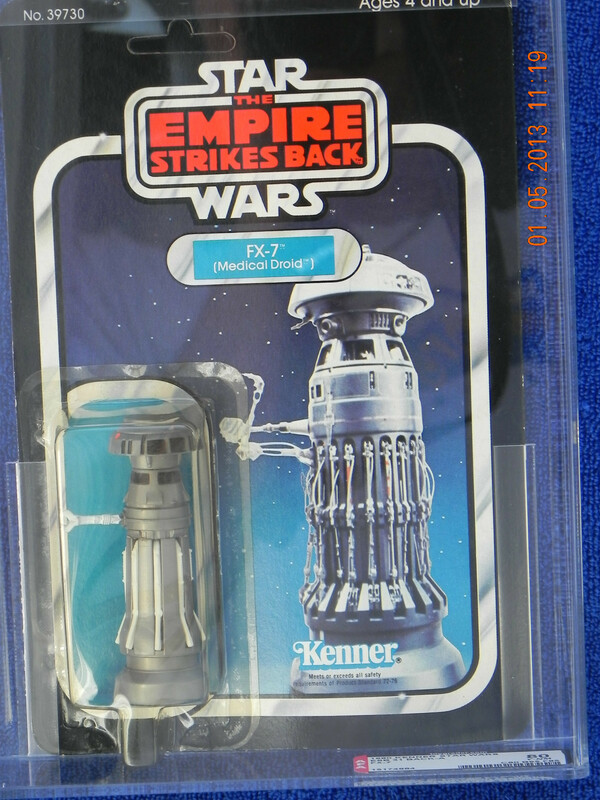 8 Pack Graded Mailer Sealed – $556 – UKG85 – UKG ROTJ 8 Pack Sealed Very hard to find are the mailers that are still sealed and in the case of this one, in extremely good condition as well. 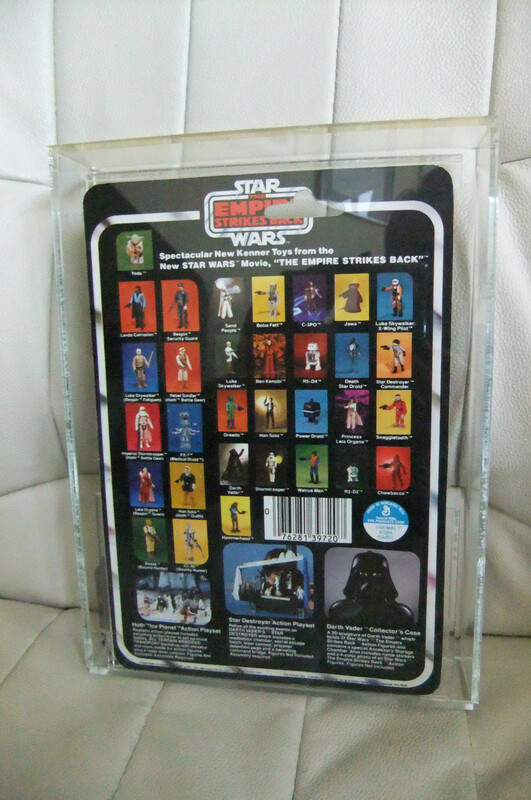 There are few examples out there of this piece graded, but only a few are still sealed like this version, rather then getting it U Graded a lot of collectors go this route and just opt for the display version. 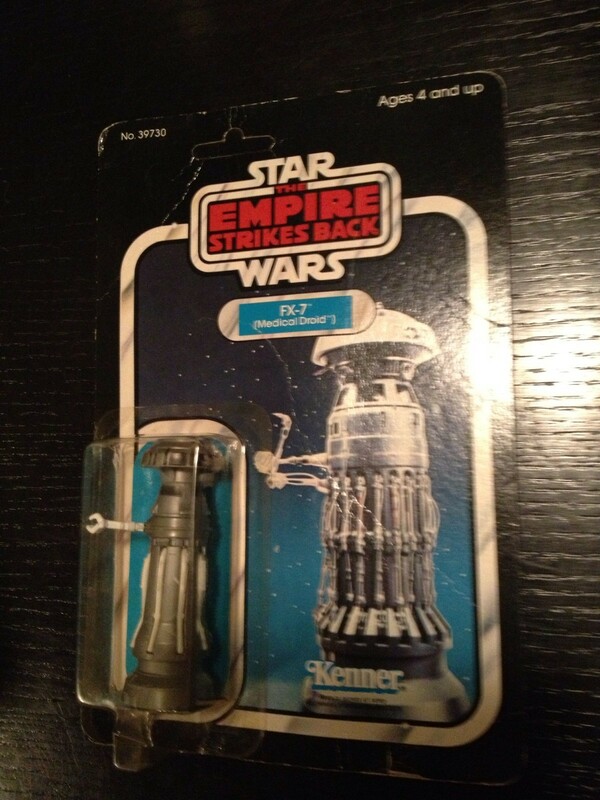 A really strong price for this piece, which was in great condition overall. 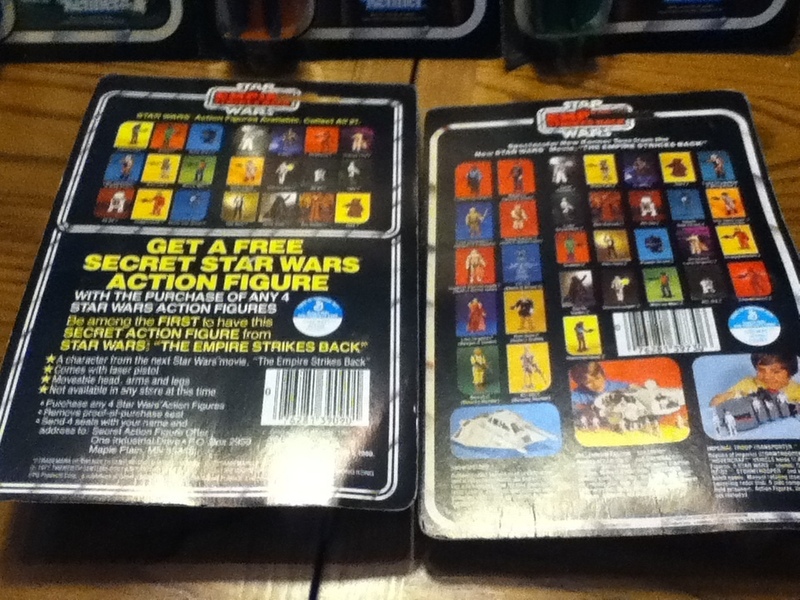 When it comes to Mailers I did want to take a second to mention the four single figure releases related to ROTJ. 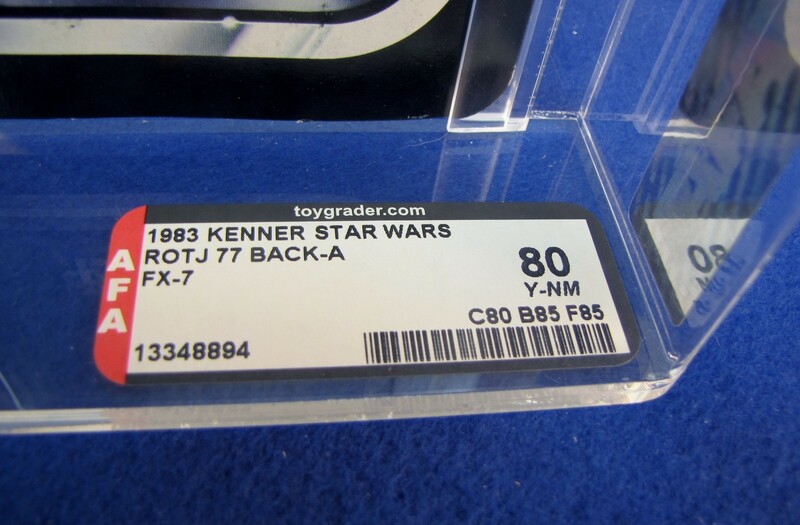 They are plentiful, but still great items to collect, below I’ve listed a little bit about the going rates I’ve seen over the past summer of 2013, values are not graded. 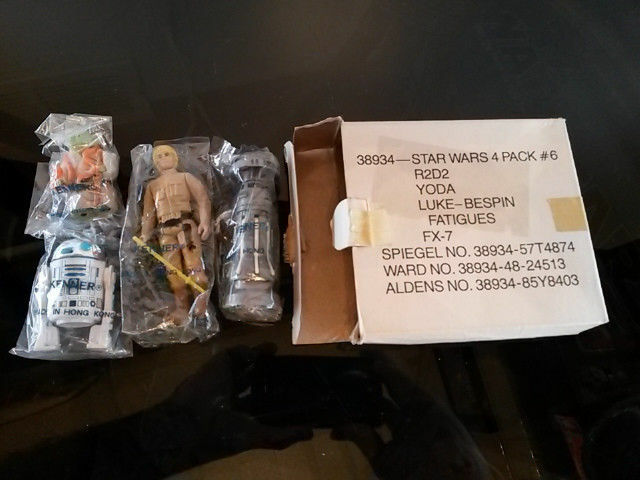 Grading costs run $30-$100 depending on the number of pieces in the mailer. 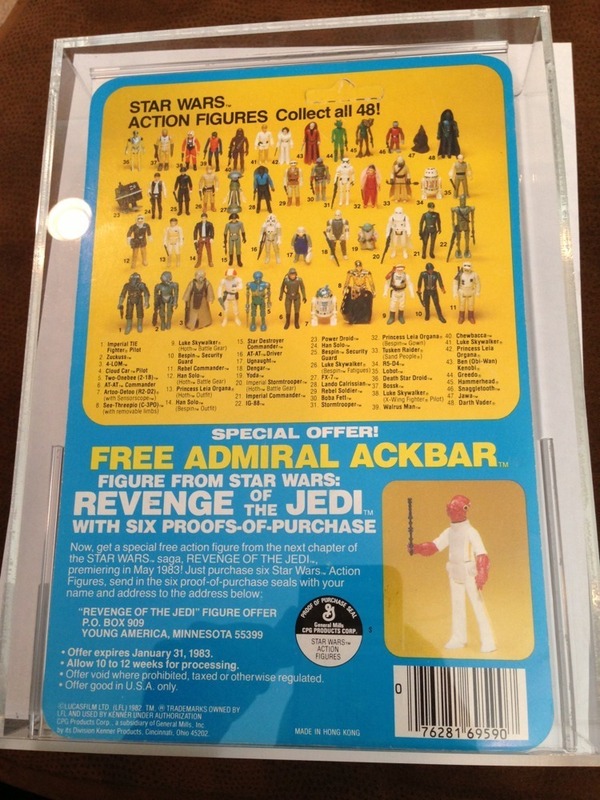 Admiral Ackbar, came in multiple versions, the more pieces of paperwork, the higher the value. 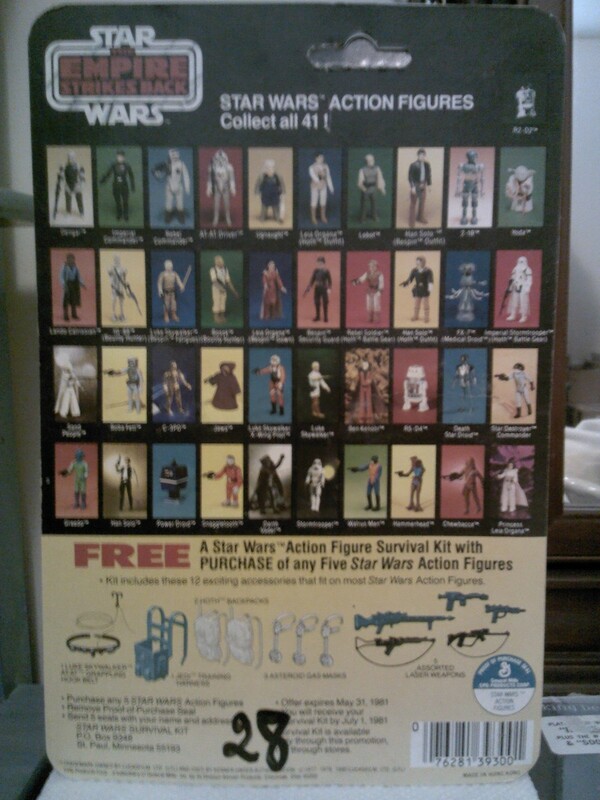 Going rate $30-70 depending on condition, again more pieces = more money! 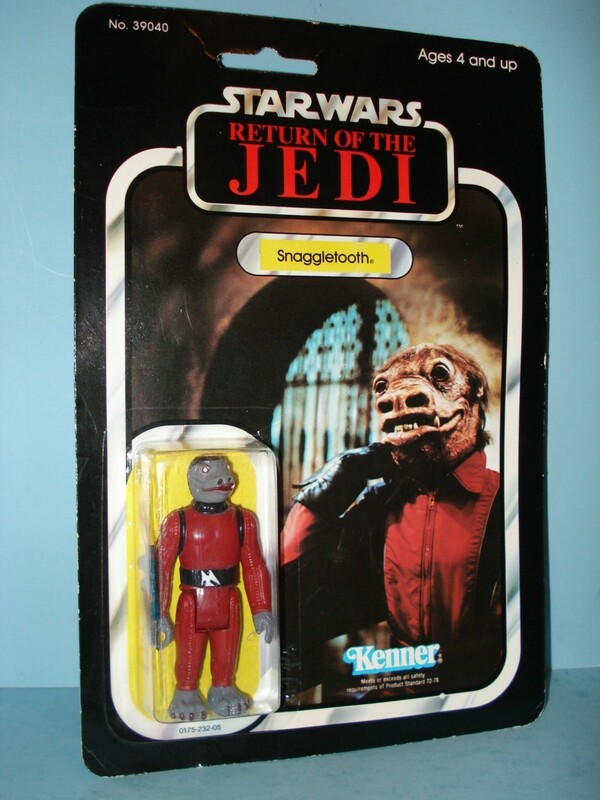 Nien Nunb, pretty standard with just the catalog, these particular items goes for roughly $25 on average for a very good example. 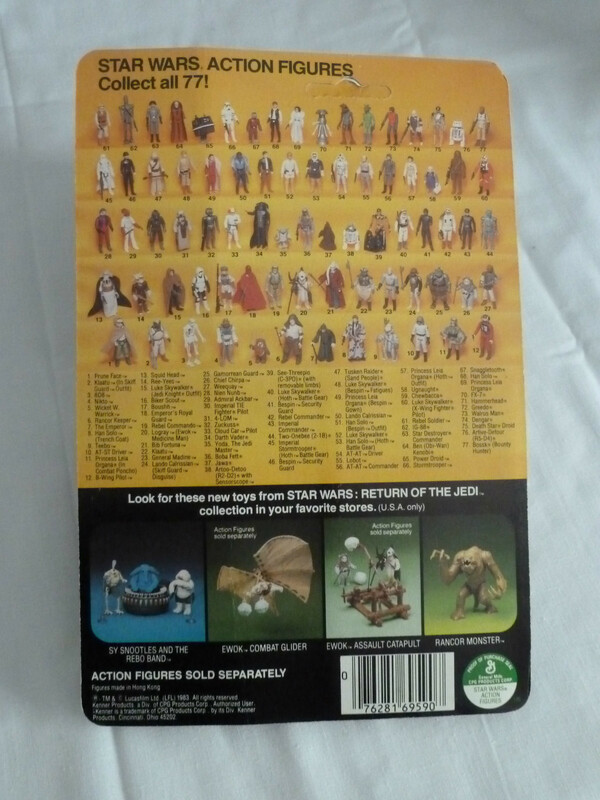 Emperor, much like Nien Nunb he mainly just came with a catalog, thus usually just three pieces to the set. 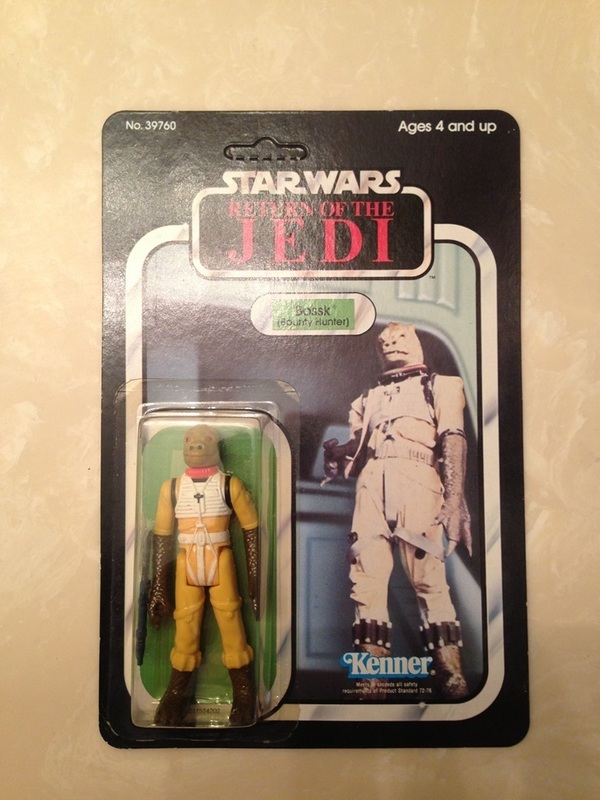 This past summer he average a price of about $15-20, you can also find him sealed for relatively cheap as well. 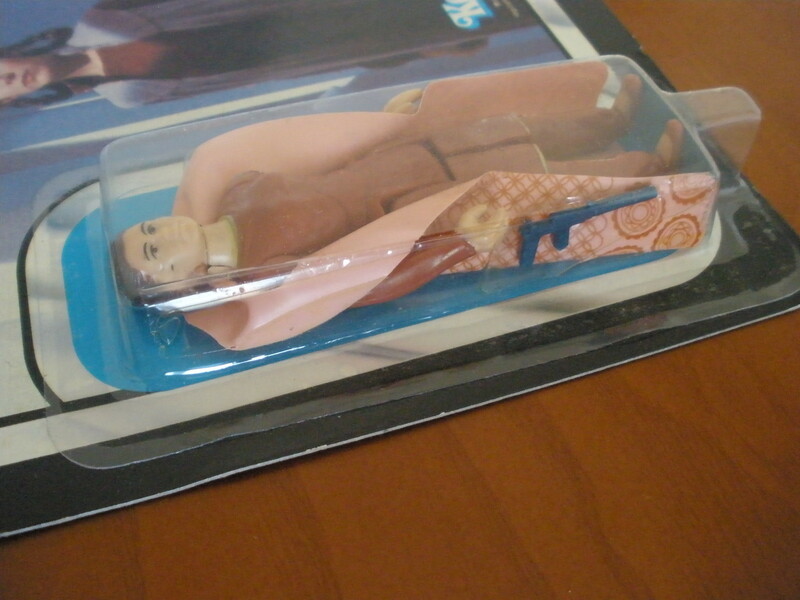 Anakin Skywalker, per capita the most expensive of the mailers, it’s mainly due to the scarcity vs. the others, in most cases about 6:1 to the other three. 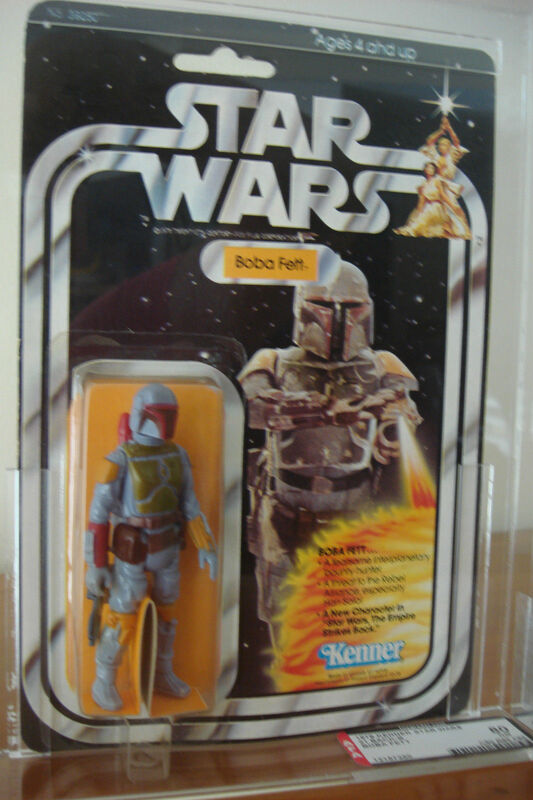 It’s lack of MOC release in the US and association with the POTF line drive this piece up to an average of about $30-40 for the three piece set. 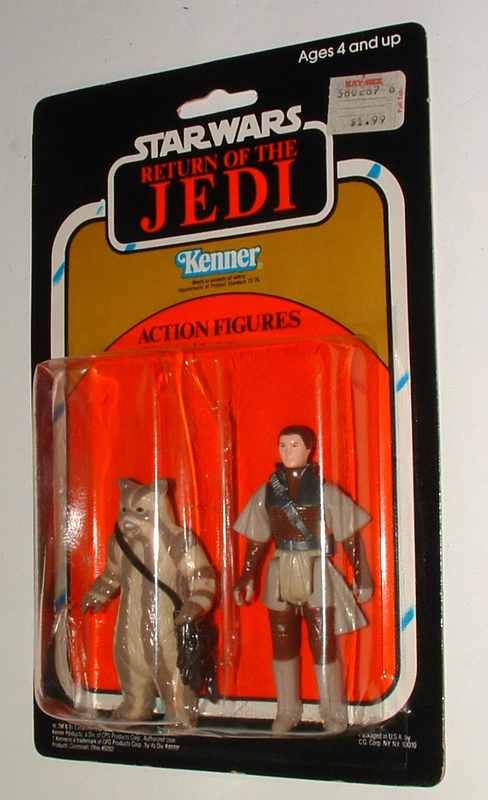 When it comes to the ROTJ release figures were plentiful. 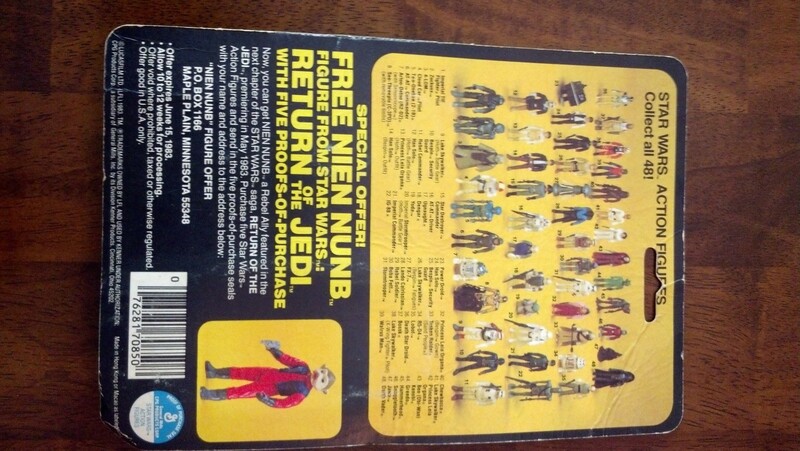 As mentioned previously there were 4 main releases in the United States, the 48 Back with Nien Nunb offer, 65 Back, 77 Back and 79 Back. 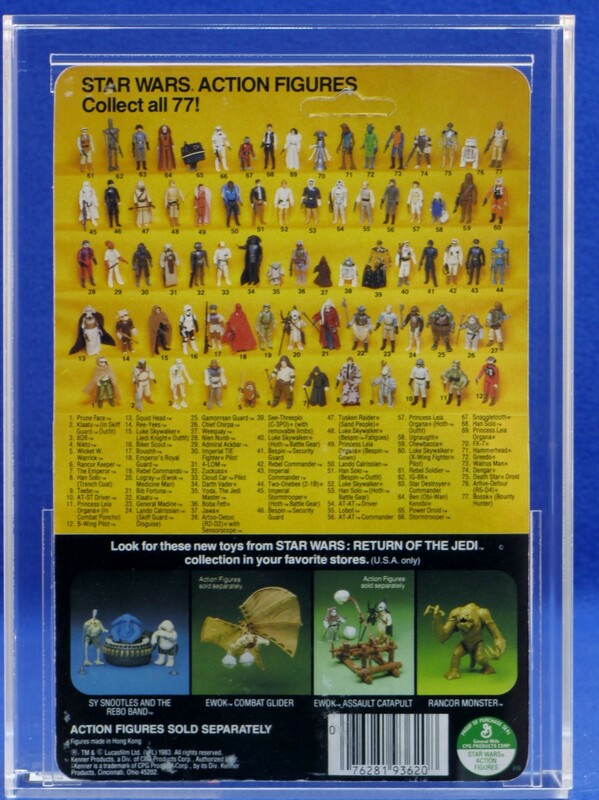 At the heart the rarity goes from 79 backs, to 48 backs to 77 and finishing with 65 backs which were the most plentiful in pure units produced. 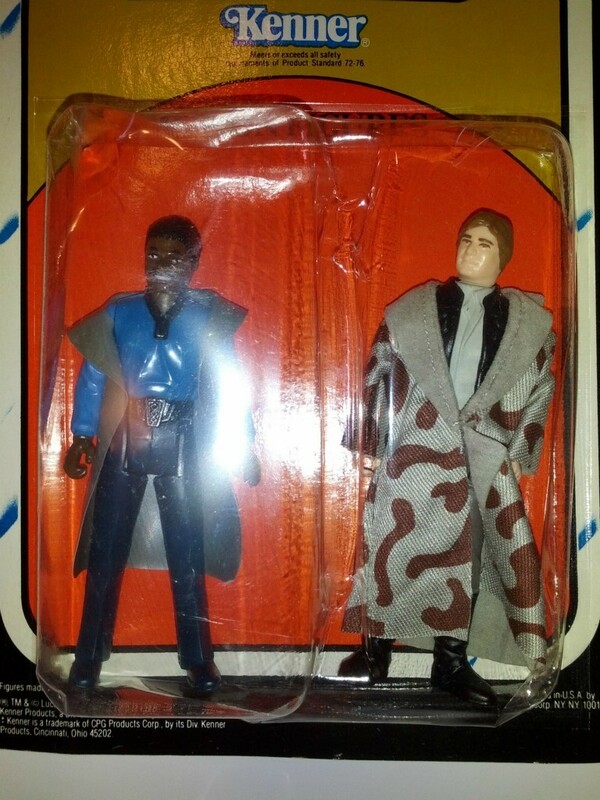 The 79 back release was somewhat limited as you can see via the Kellerman matrices. 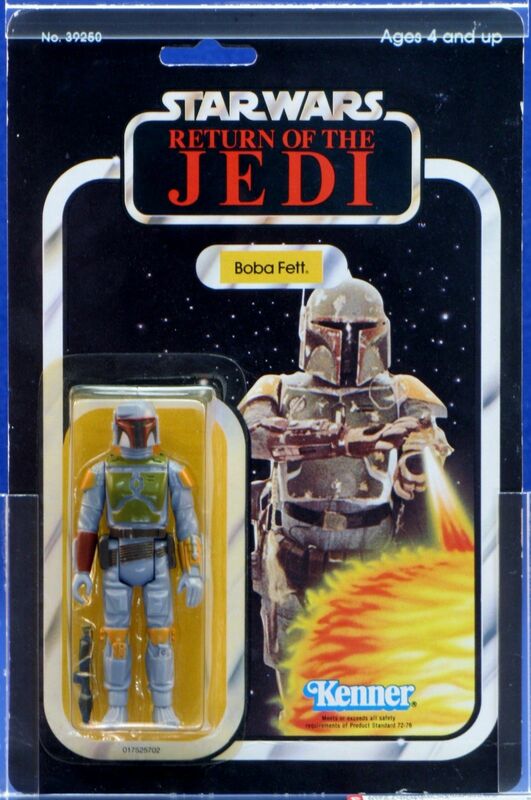 The release was really just The series saw a strange phenomenon that would carry over into the POTF line; that being the eventual yellowing of the figures bubbles. 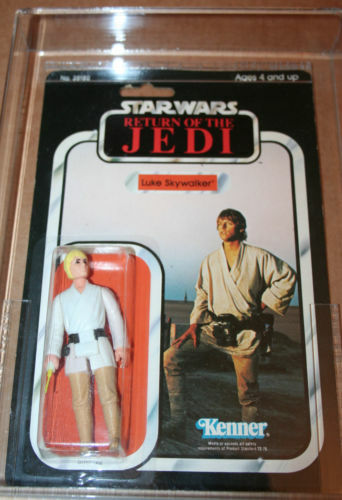 All in all just from a grading perspective nearly 80% of ROTJ figures had issues with their bubbles yellowing. 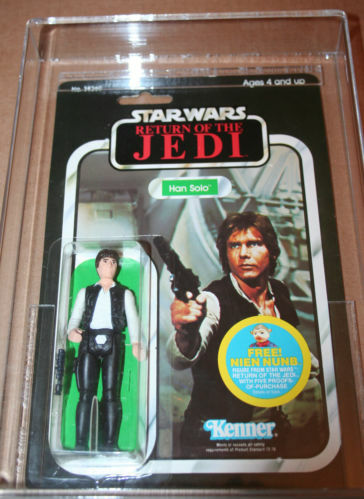 The series saw 7 figures re-released with new photos for the packaging, along with other variants such as Luke’s Hair Color, Han’s Lapel, Biker Scout’s Mask, and Luke’s Lightsaber. 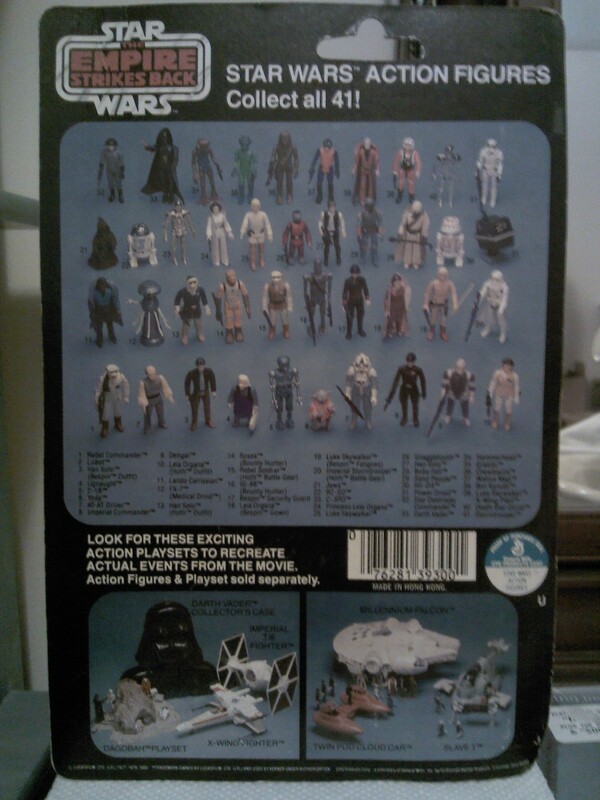 Thus all in all there was a lot out there in terms of just MOC variants (90 to be exact). 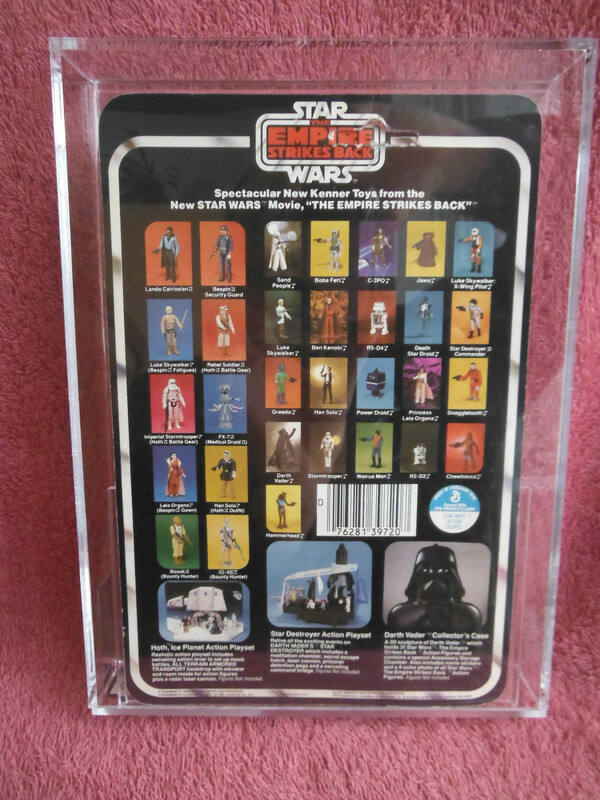 Here we have a sampling of the figures released on ROTJ Cardbacks, overall we mixed up some AFA figures with non-graded MOCs, we tried to keep this limited to just clear MOC figures, but let in a few tinted cards where we needed. 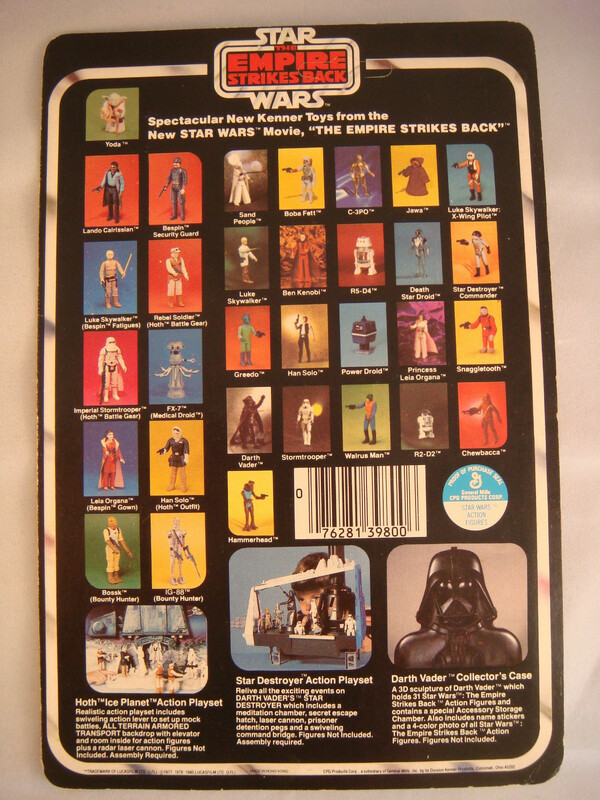 You can see a lot of breadth here, but what really surprises me are some of the price swings. 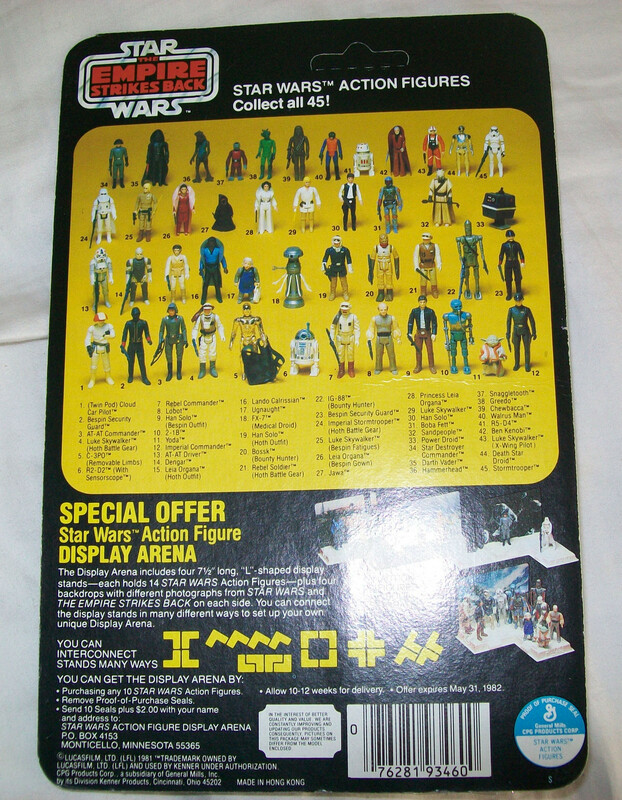 Some of these were incredible bargains and a few saw nice premiums for the sellers. 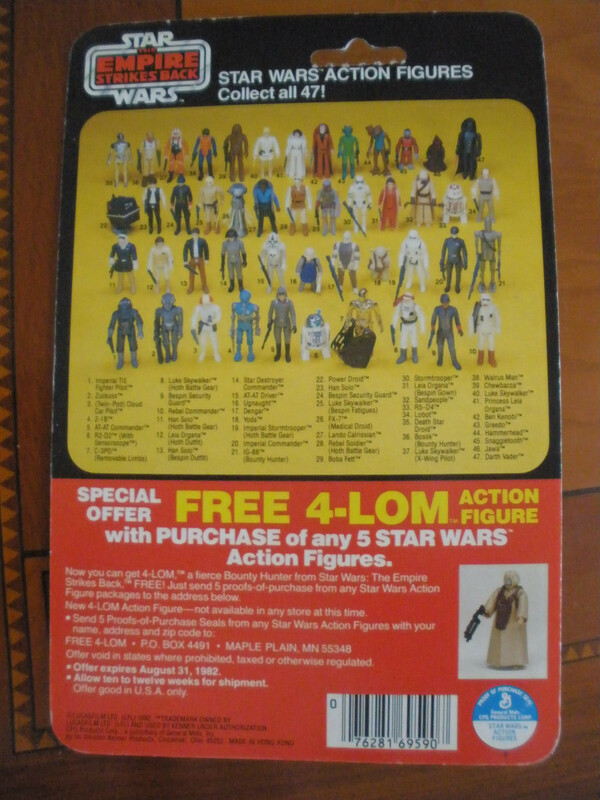 Because of the number of items I’ve just stuck to some basic information, the figure, condition, price, grading disposition, a link, and a few words on each. 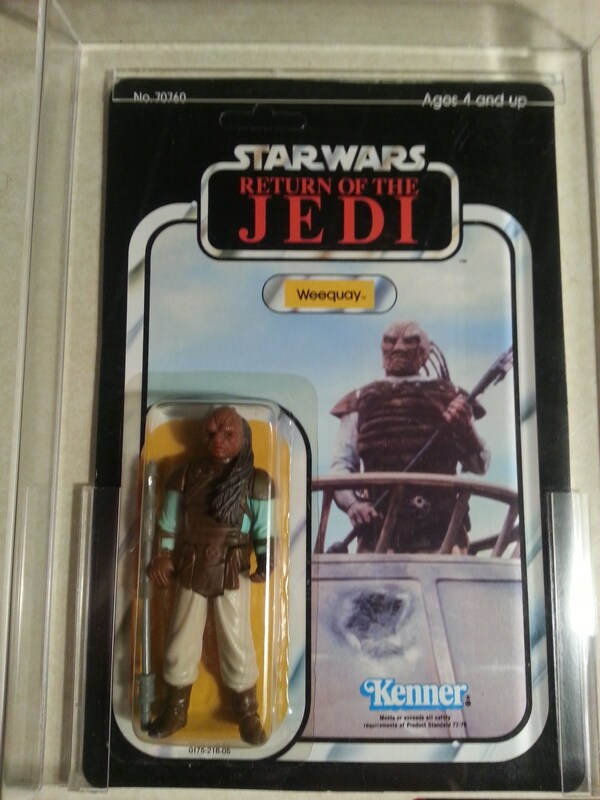 Bossk MOC – C9 – $150 – Bossk MOC Here’s a great example of Bossk, near the top of the mark in terms of condition this version saw a strong showing with a price of $150, thus supporting the hypothesis that people will pay big dollars for clear bubbles and great condition items. 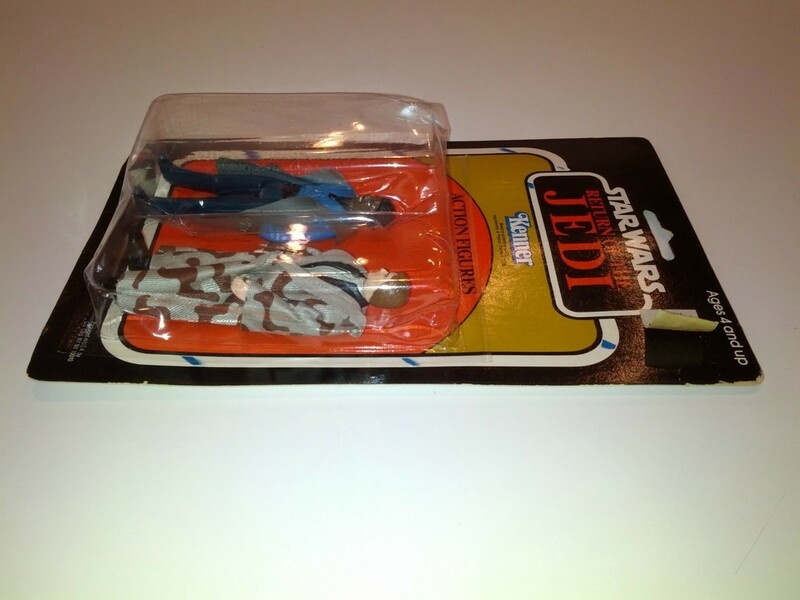 Chewbacca – C9 – $135 – Chewbacca ROTJ 48 Back Chewy is always a fan favorite and here we have to toughest of the ROTJ MOCs to find, that being the 48 back. 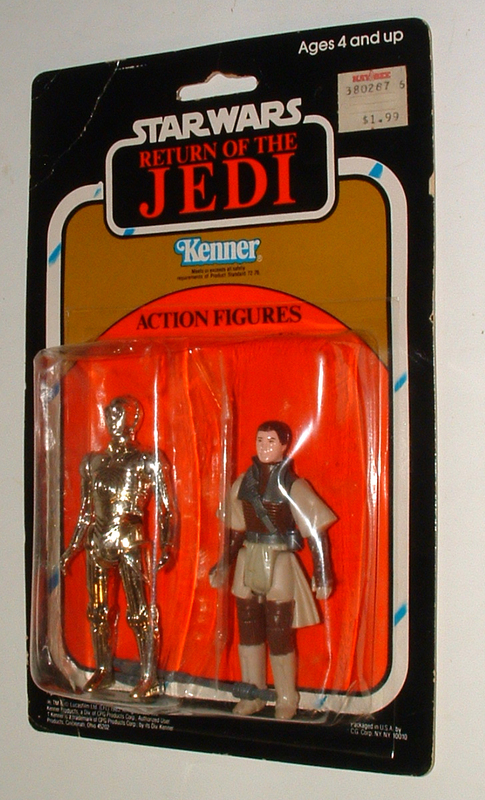 Here we saw a good price for a figure that typically is the middle of the road when it comes to the ending price. 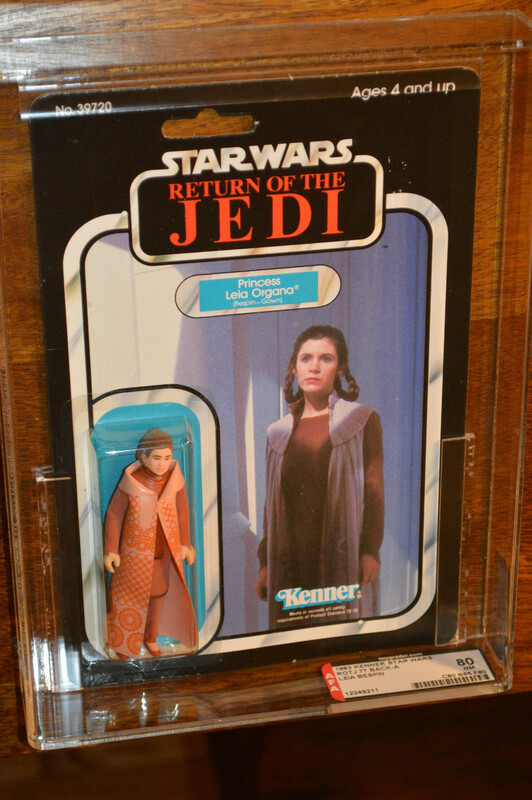 ERG – Clipper – $380 AFA85 – ROTJ Emperors Royal Guard MOC Clipper Just to shake things up a bit we have included one foreign item from the ROTJ line up. 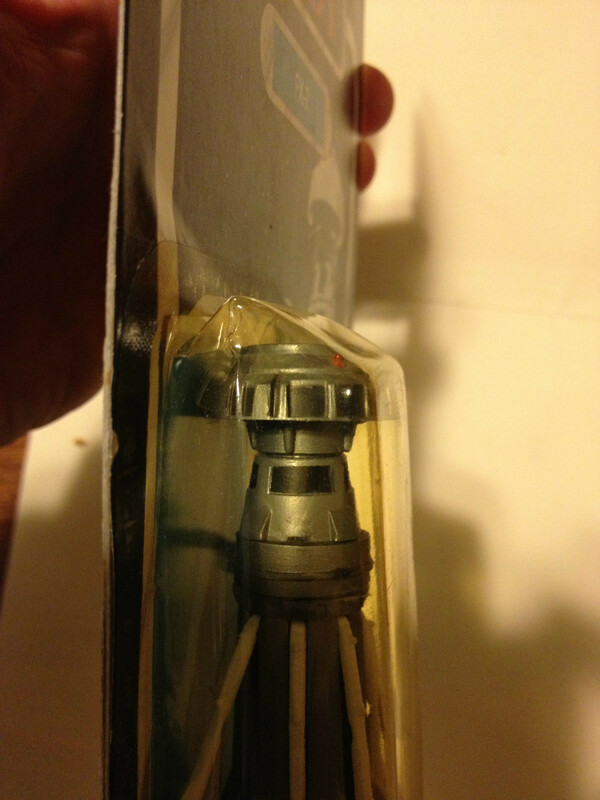 This ERG clipper went for a large sum of money but that’s how things go in the Clipper world. 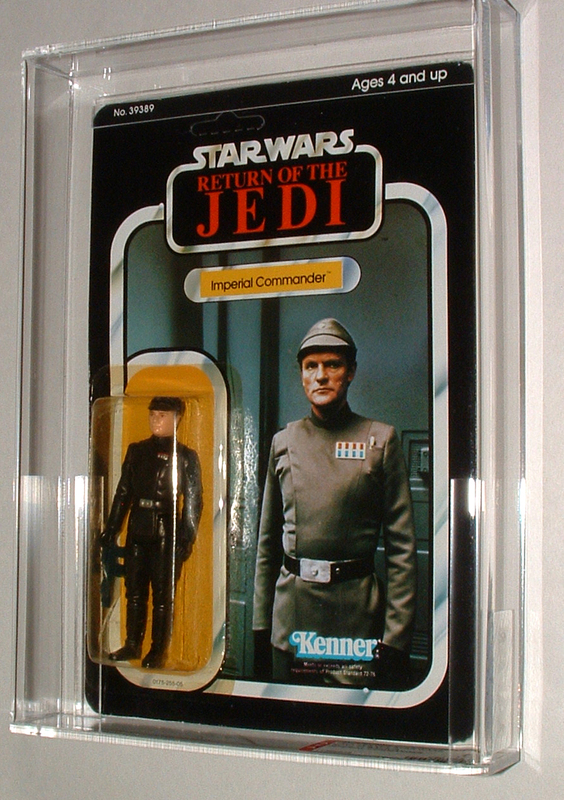 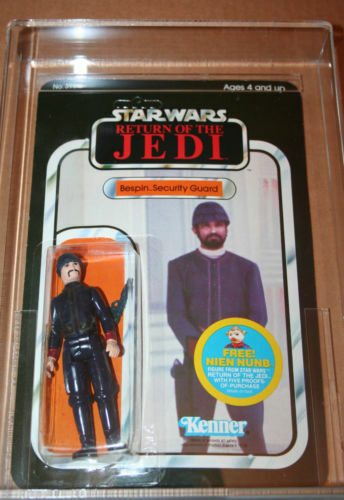 Always popular with collectors the Royal Guard could be the best figure released in the ROTJ series. 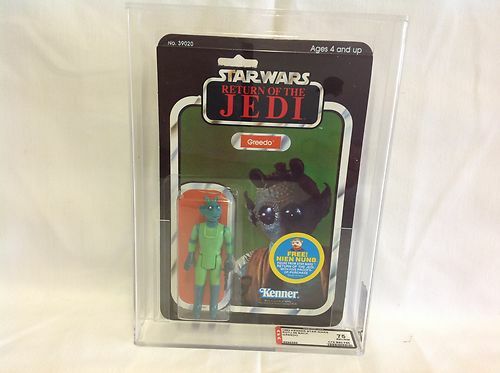 Greedo – 48 Back – AFA75 $190 – ROTJ Greedo 48 Back MOC Although he was killed in the first hour of the first movie, Greedo remains a favorite figure of many collectors today, myself included. 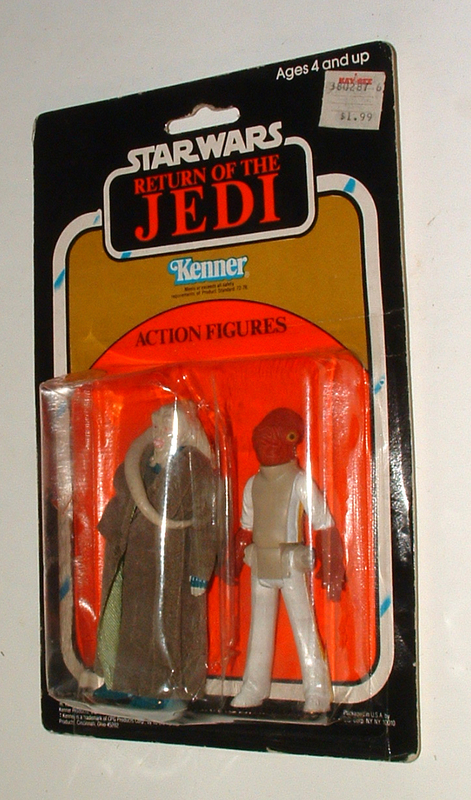 Here we have a 48 back with a grade of 75. 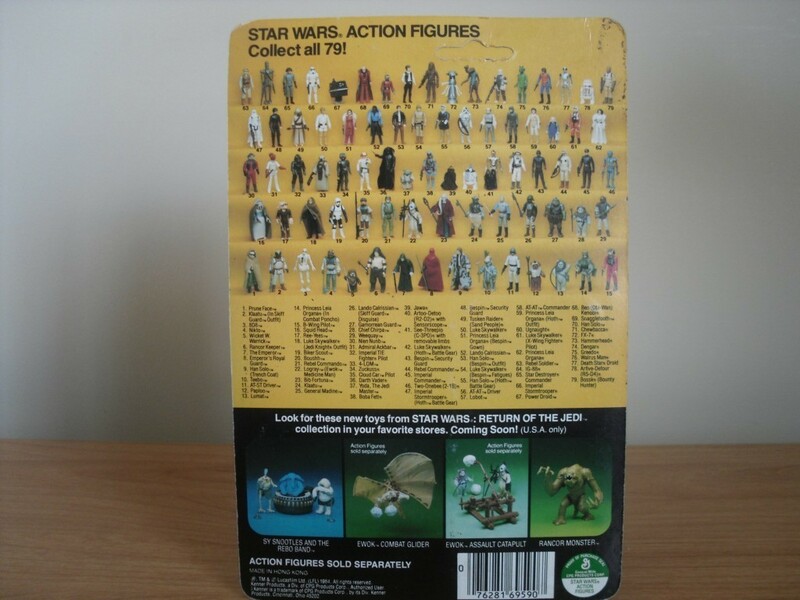 Like most of the 48 backs there isn’t a vast number of any figure in the series readily available, with most figures having less then 10 examples graded throughout the years. 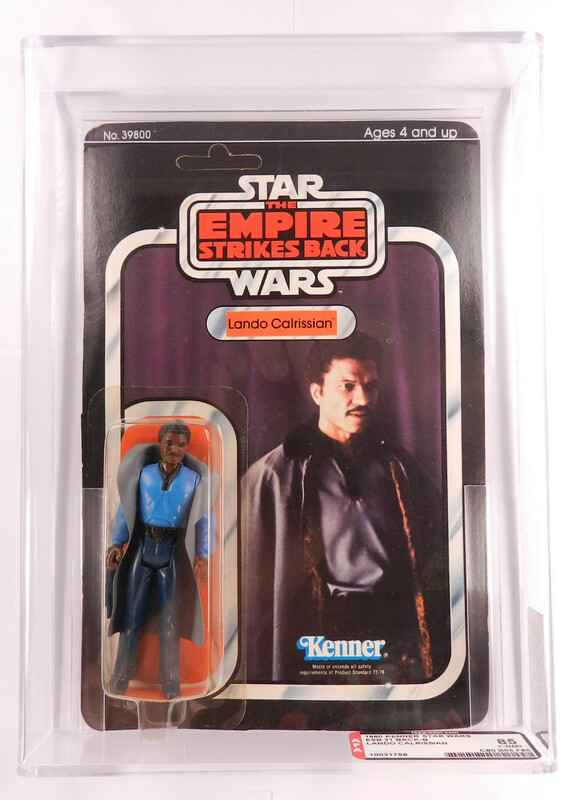 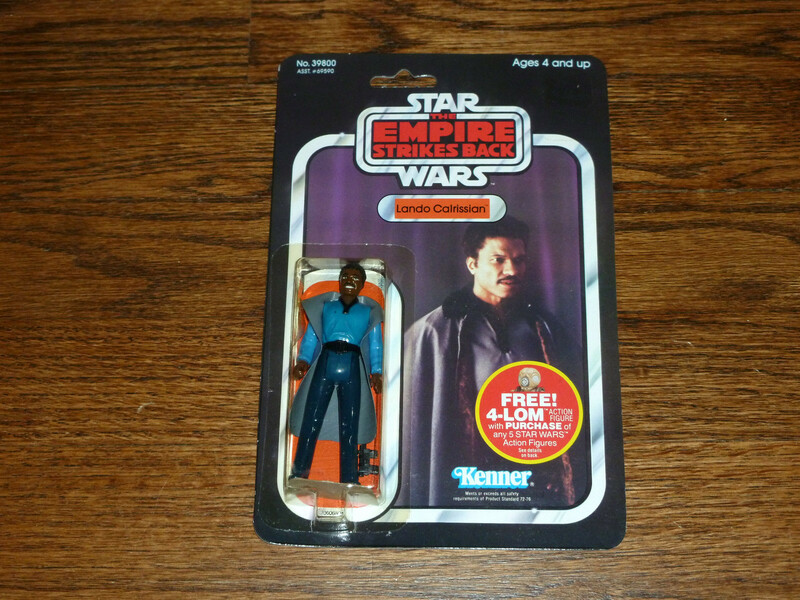 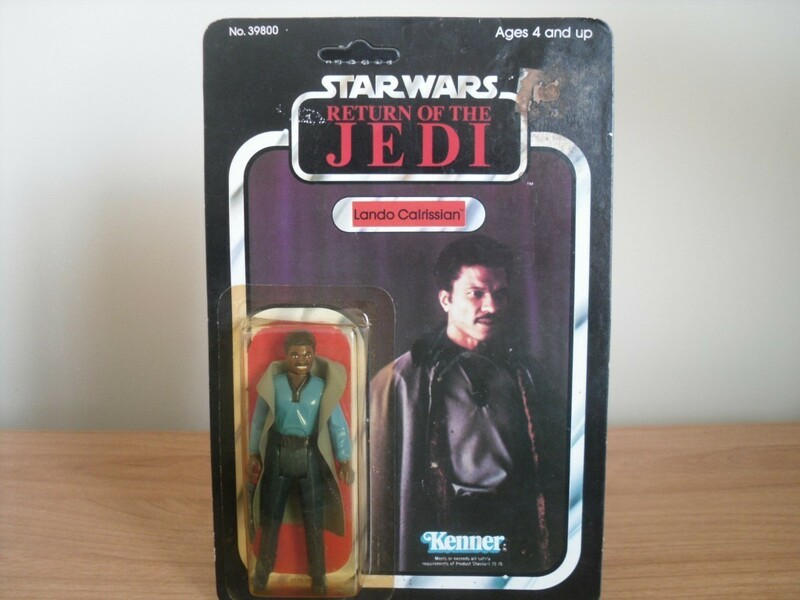 Lando Calrissian – AFA80 – $220 – Lando Calrissian MOC AFA80 The Lando man saw a great price realized on this AFA80 clear bubble auction, it’s funny as I believe I bought mine (ungraded) for around $50, and it was graded am 80 clear eventually as well. 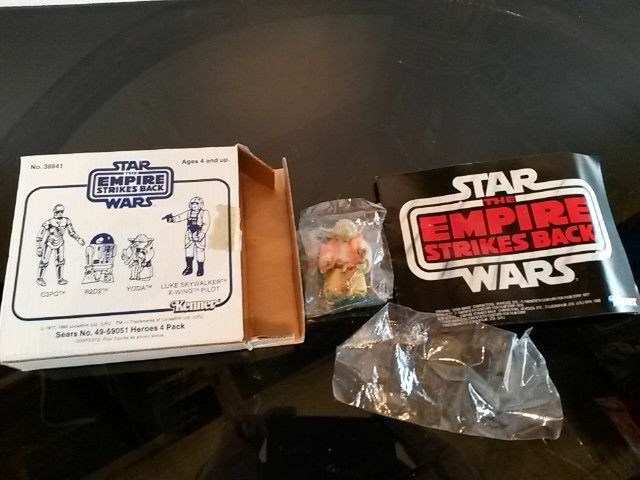 A great looking piece and an awesome price for the seller. 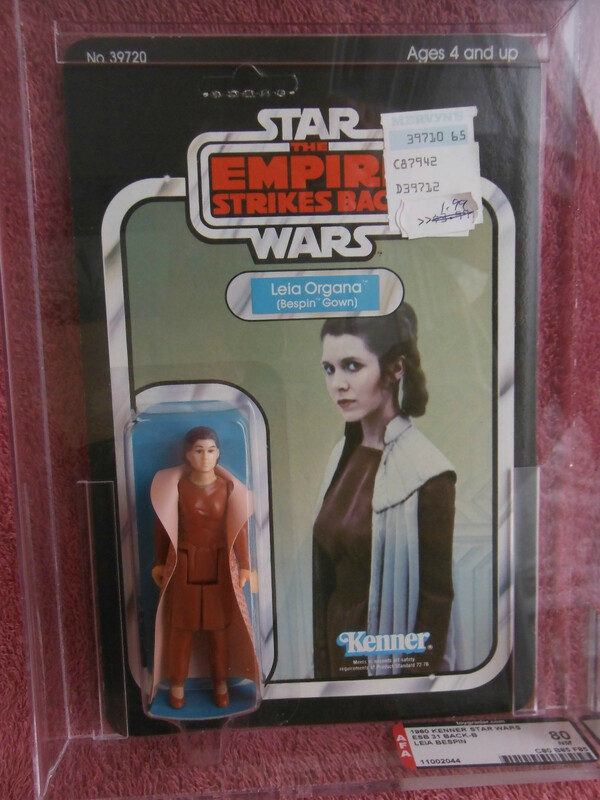 Princess Leia Organa 48 Back – C7 – $244 (Resold at $204) – Princess Leia Organa 48 Back Sometimes basic logic doesn’t come into play in the world of figure collecting. 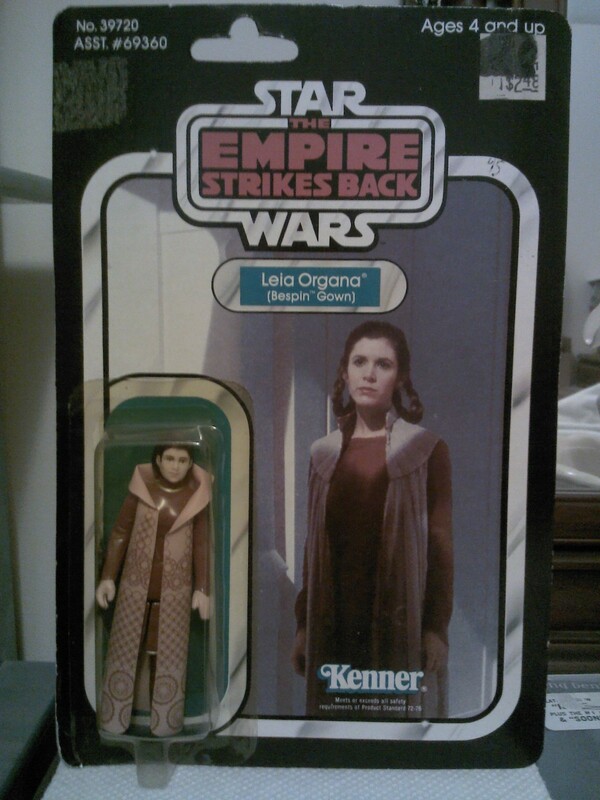 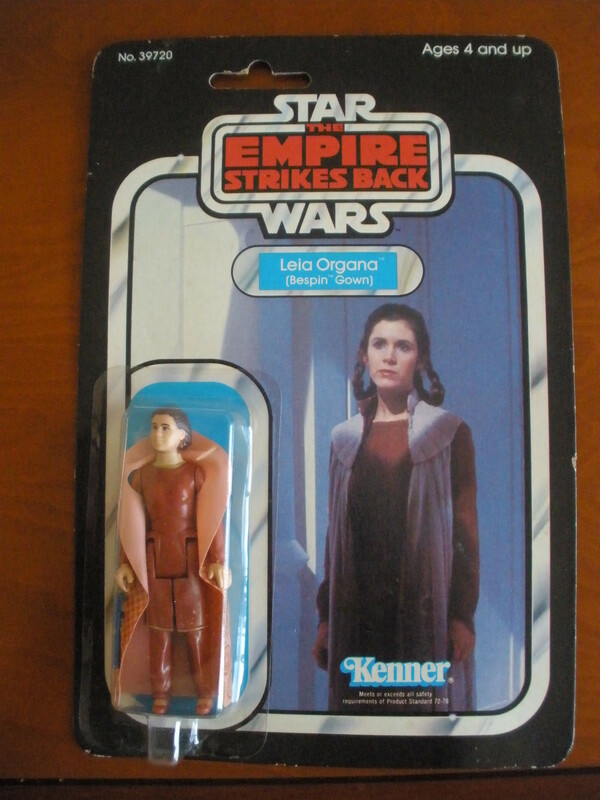 The ROTJ release of the original Leia figure is the rarest of any of the three movies, with the 48 back being an exceptionally difficult item to find. 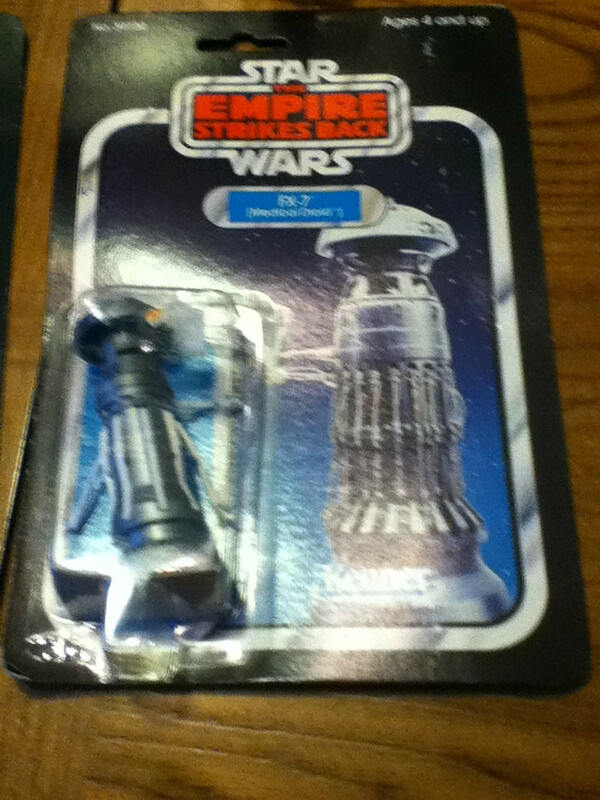 However here we have one that sold for an extremely reasonable price. 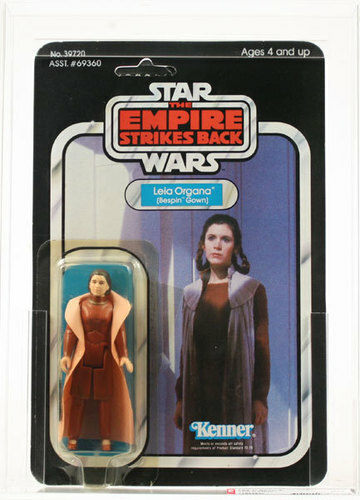 Condition could be the issue, however most of the 48 back Leia figures graded and in MOC circulation are in extremely poor condition, thus I’m not really sure why this didn’t pull in the average price of $400 at least. 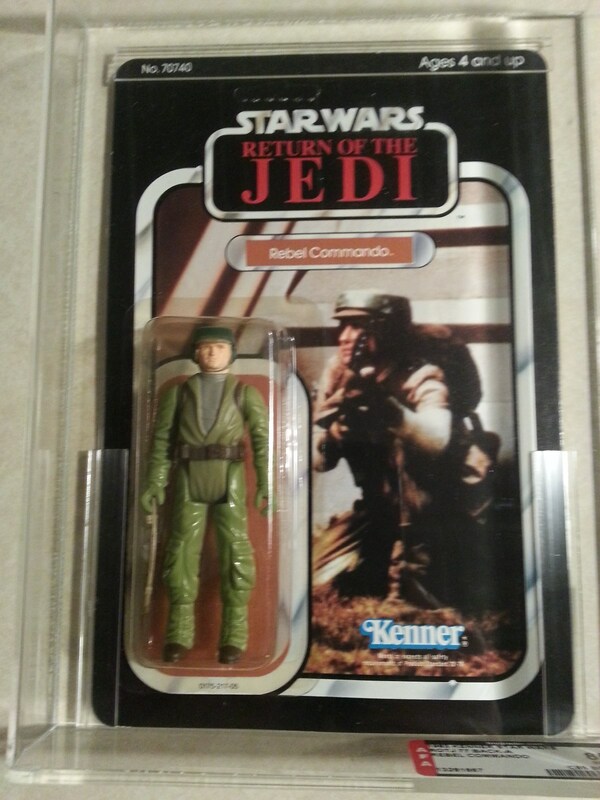 Rebel Commando- AFA85 – $149 – Rebel Commando MOC A very nice example and one of the few AFA85 figures that we’ve seen this month, the Rebel Commando, along with Klaatu, Weequay (See below) and a few other ROTJ release figures have consistently been seeing top dollar for good examples as good quality versions of these figures are tough to come by. 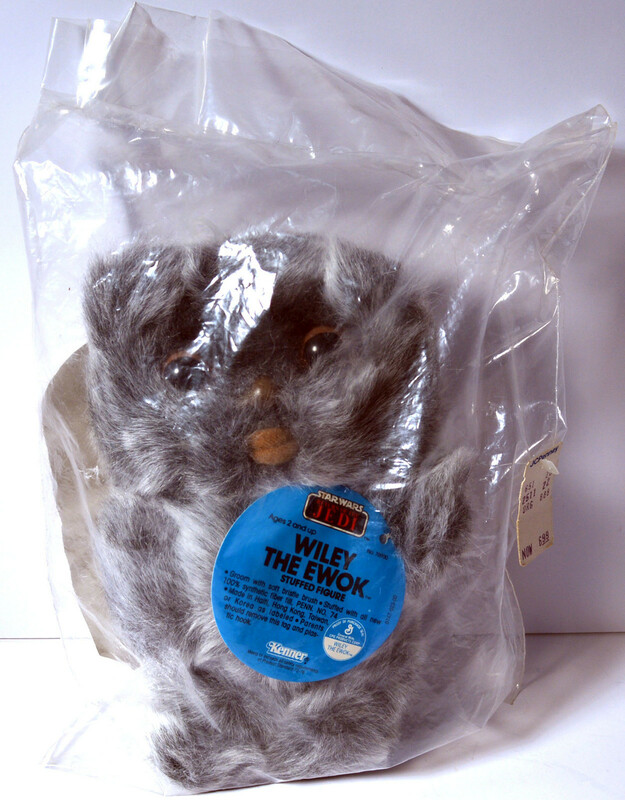 Wicket MOC 77 Back – AFA – $239 – Yoda Alt Photo AFA 80 Our only Ewok figure this month, here we have a great example of Wicket. 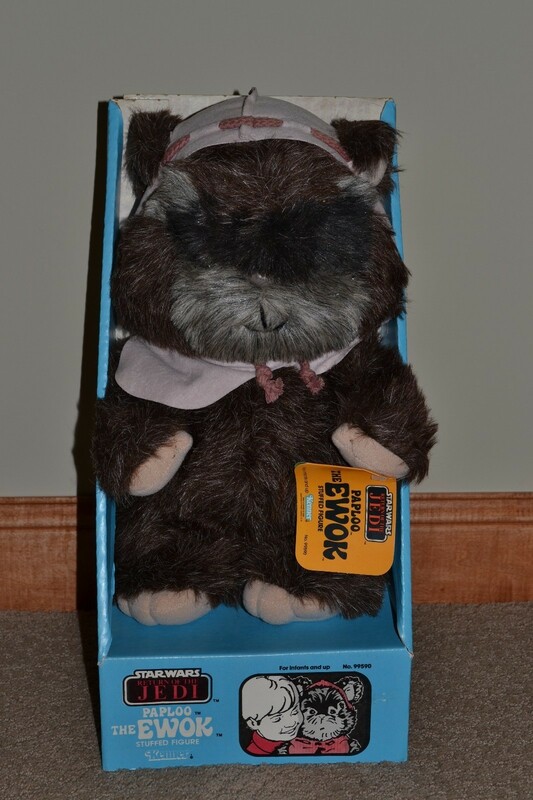 Probably the most sought after of the Ewoks, he demands a top price, in this case right on the money at $239 for an AFA80. 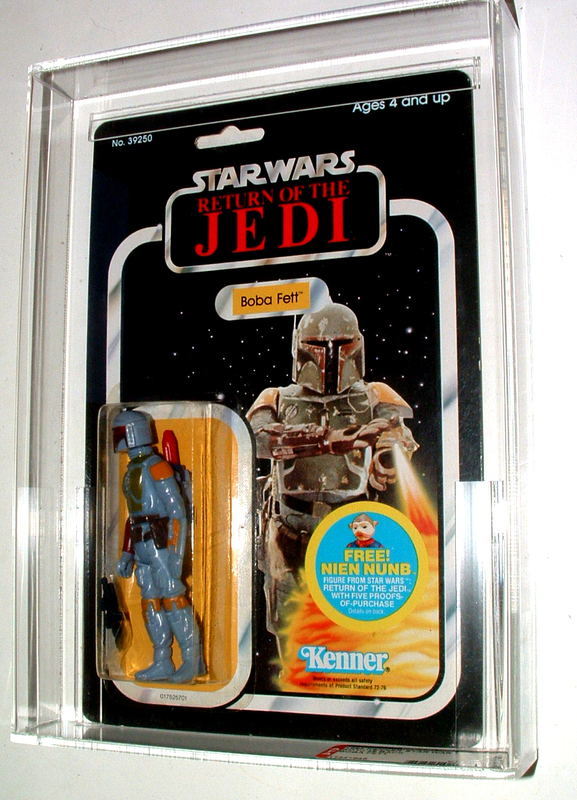 He’s particularly very difficult to find with a clear bubble, close in difficulty to Emperor or the Rancor Keeper. 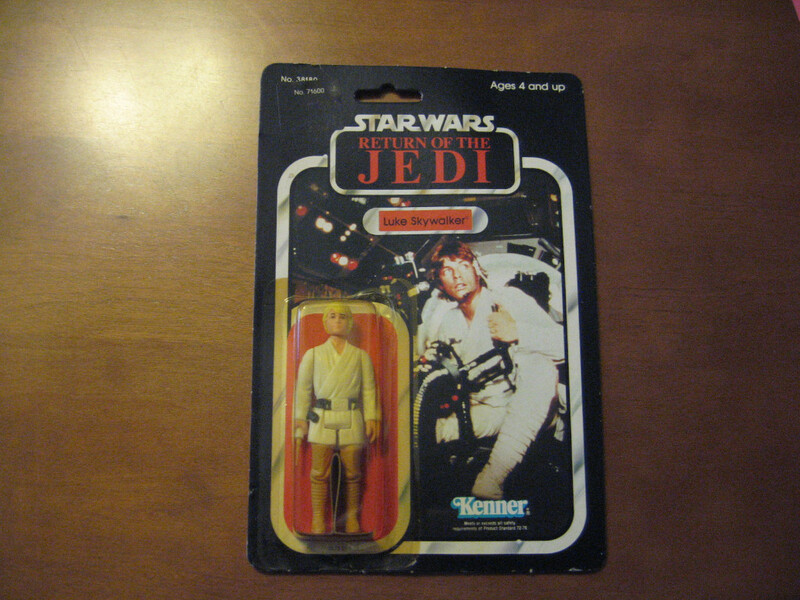 2 Packs This could be referred to as the Summer of the 2-Pack, not to be confused with the Summer of Tupac. 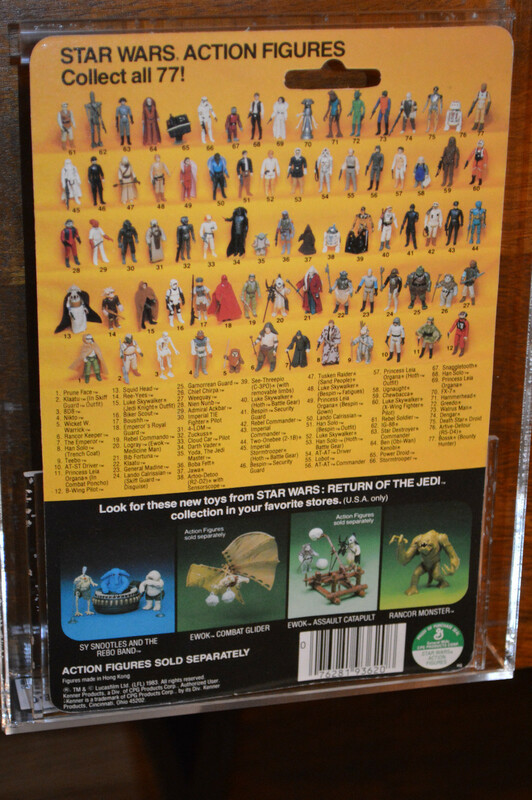 Droves of the ROTJ 2-Packs hit the market this summer, with nearly 20 represented below for your review. 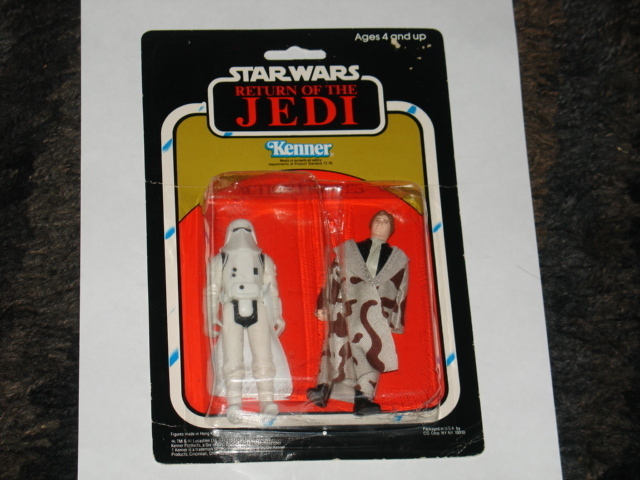 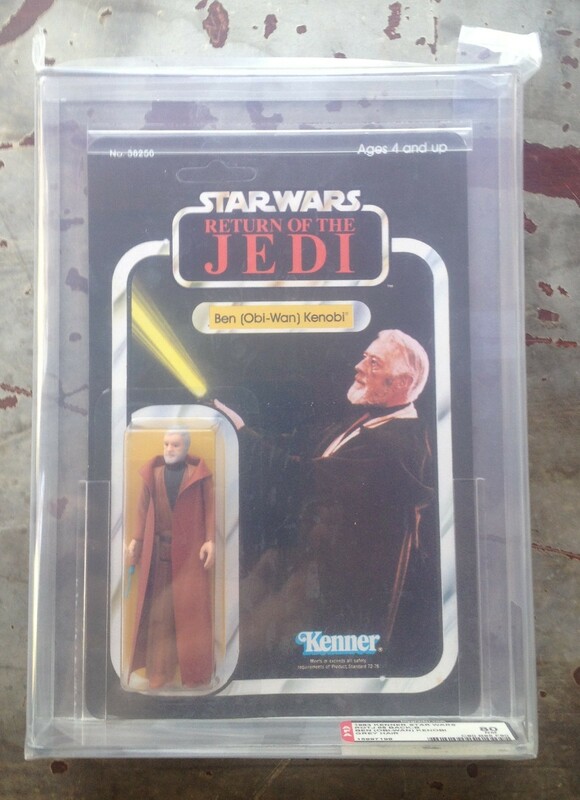 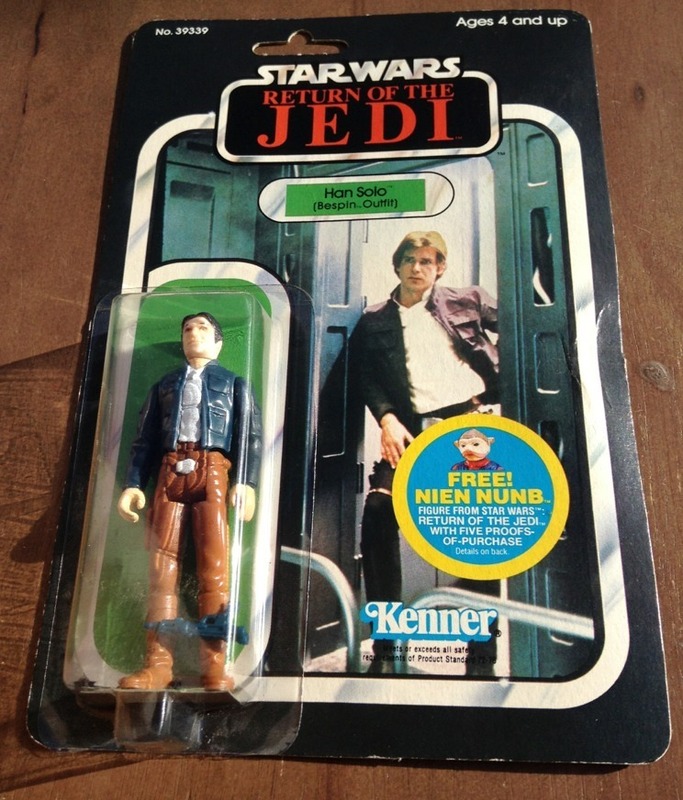 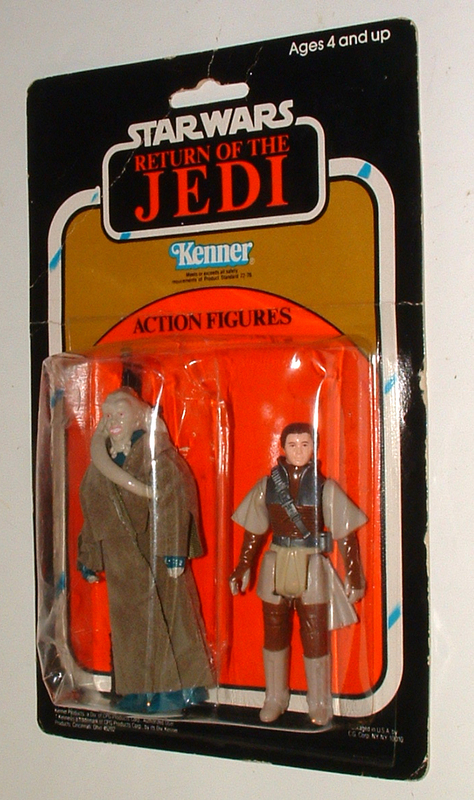 One of the most unloved items of the Vintage Kenner line, this was basically a clearance strategy for the overstock figures that Kenner was holding onto towards the end of the ROTJ toy run. 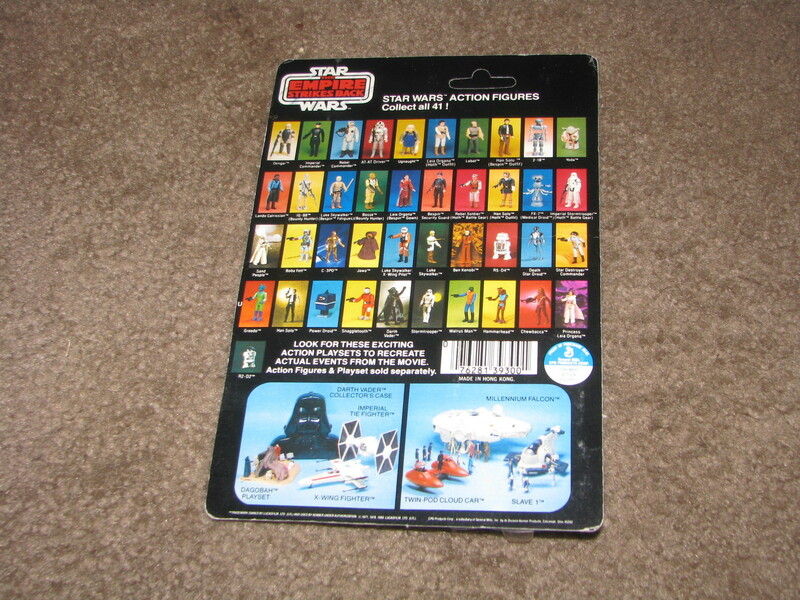 Plagued by dented and cracked bubbles, card backs with generic artwork and blank backs, this was Kenner Star Wars on the cheap. 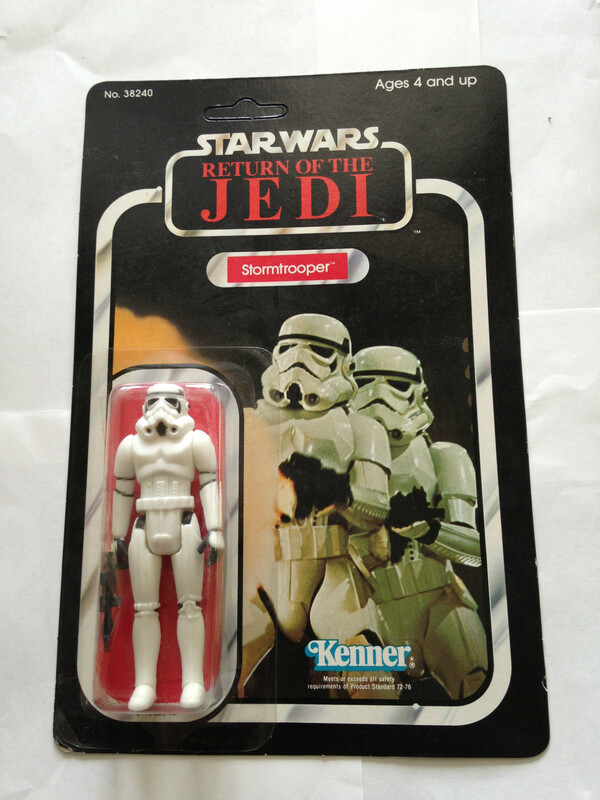 However those that survived in good condition have homes amongst focus collectors and see strong prices especially for certain figure combinations. 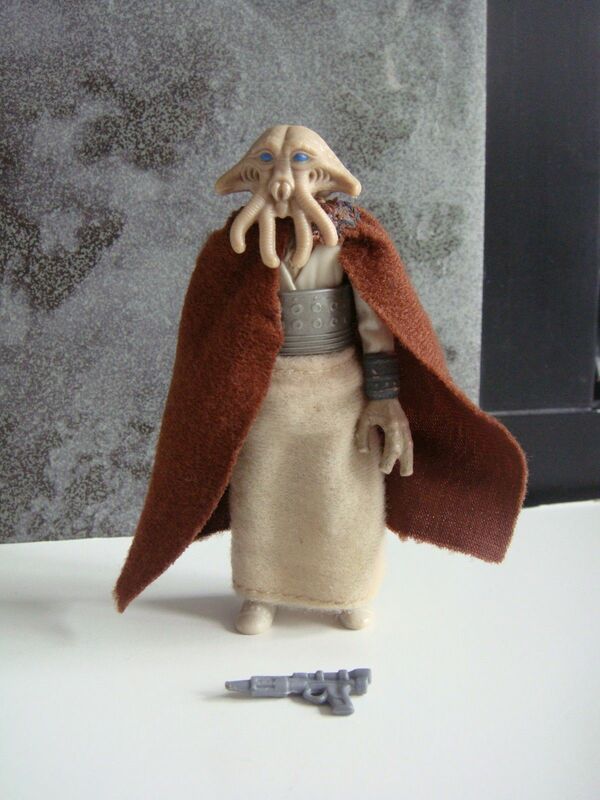 Bib Fortuna Ackbar – $222 ROTJ 2-Pack Bib Fortuna Admiral Ackbar The first of four 2-Packs featuring Bib Fortuna as our left character in the bundle is also the most expensive and in the best overall condition. 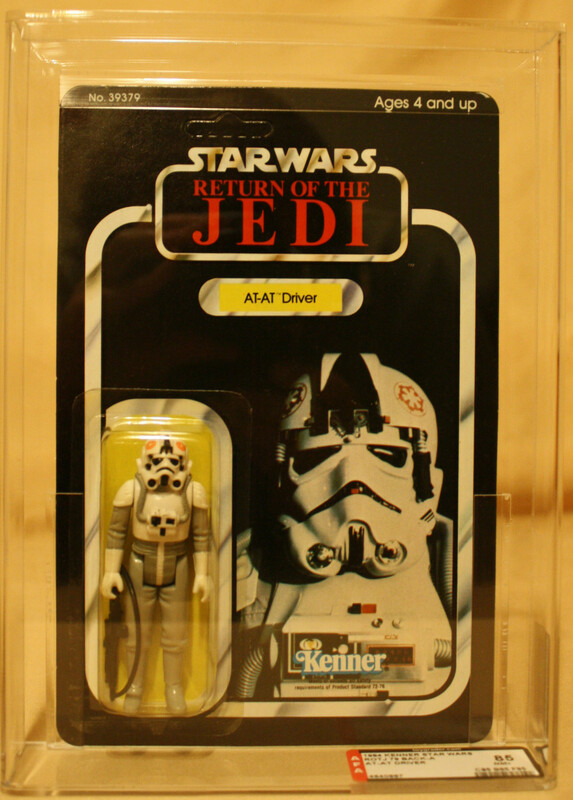 Condition is important to some for these items, as in recent history the highest grade ever given to a 2-Pack was an AFA75. 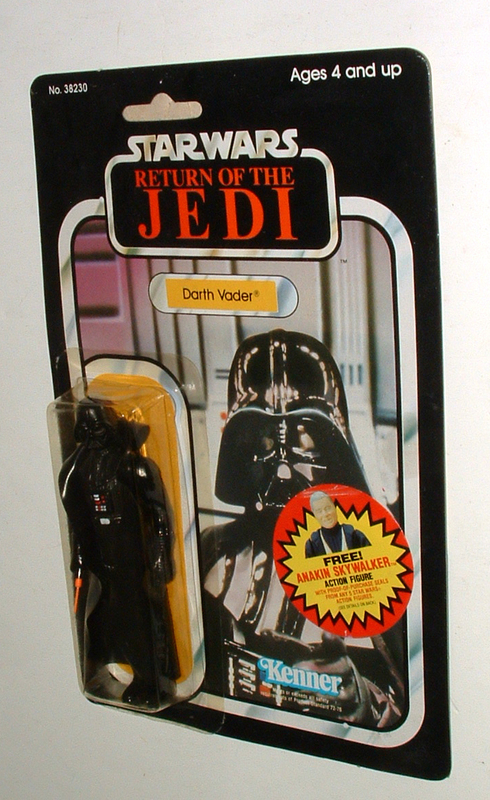 IG-88 Darth Vader – $436 ROTJ 2-Pack IG-88 Darth Vader I think one of the biggest groups of collectors who pick up 2-Packs are character focus collectors, they make a nice addition to a character collection and a bit of randomness given there really was no rhyme or reason for how these were thrown together. 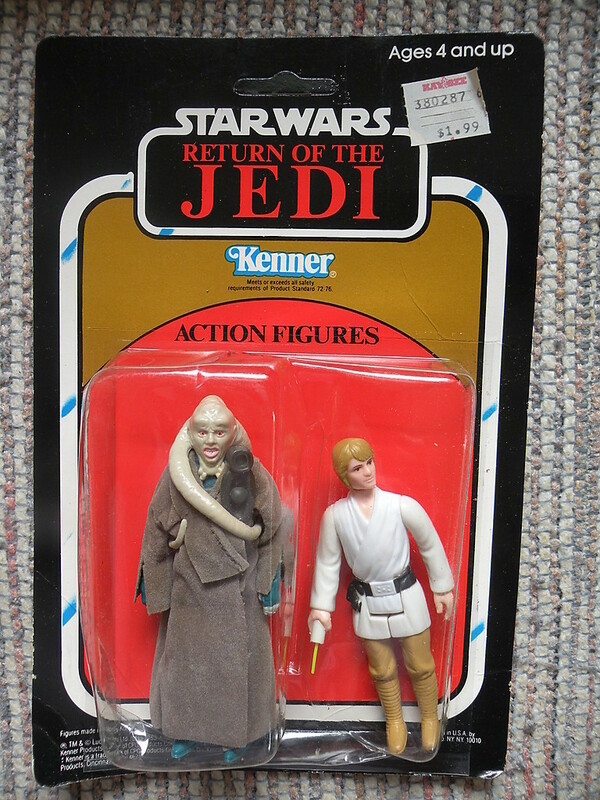 Luke Original Bib Fortuna – $410 – ROTJ 2-Pack Luke Skywalker Bib Fortuna Nearing the end of our list we find a very rare item, that being the inclusion of Luke Tatooine in a 2-Pack, along with Yoda he is one of the toughest to find in a 2-Pack from this series, in part due to the fact that these were overstock figures and both Luke and Yoda were such popular figures in the main release. 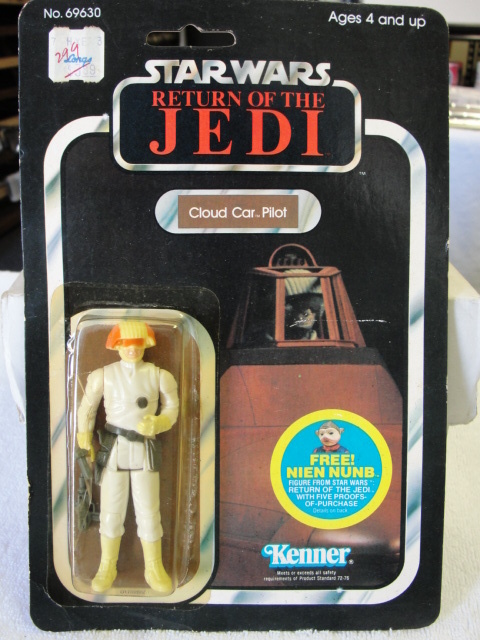 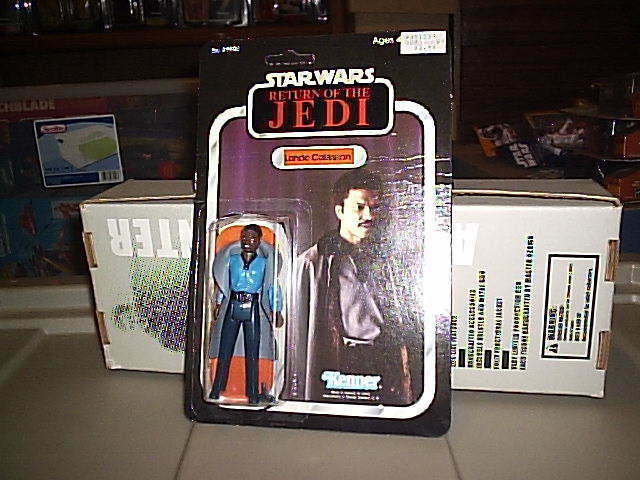 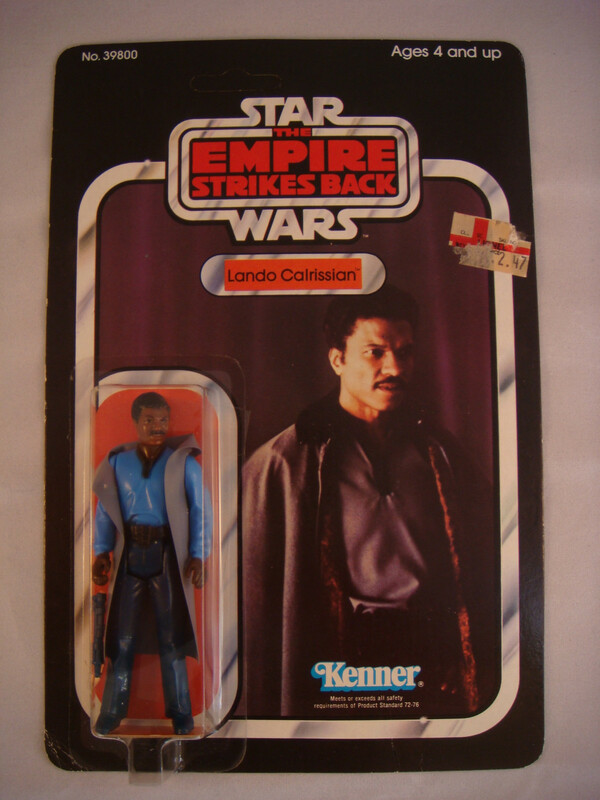 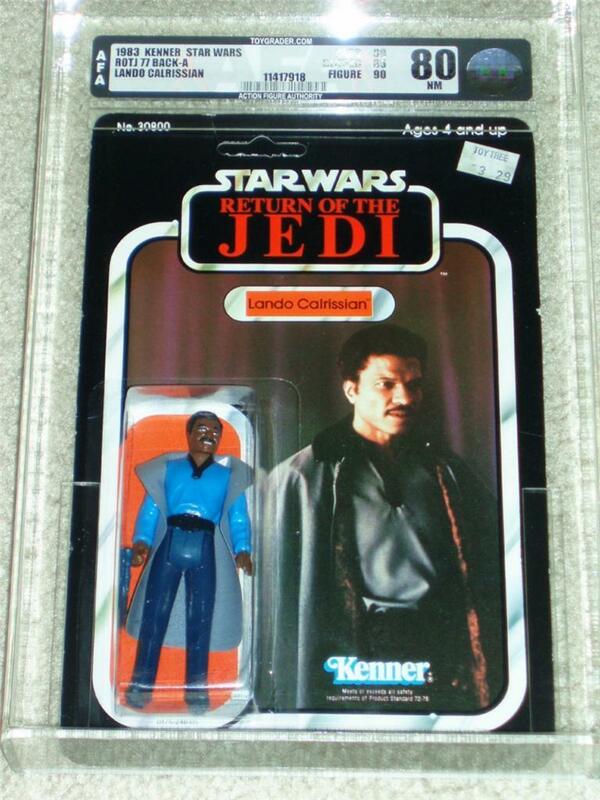 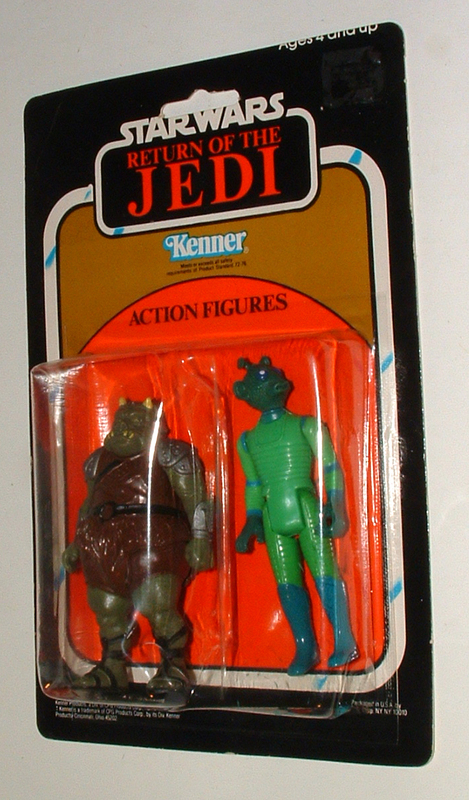 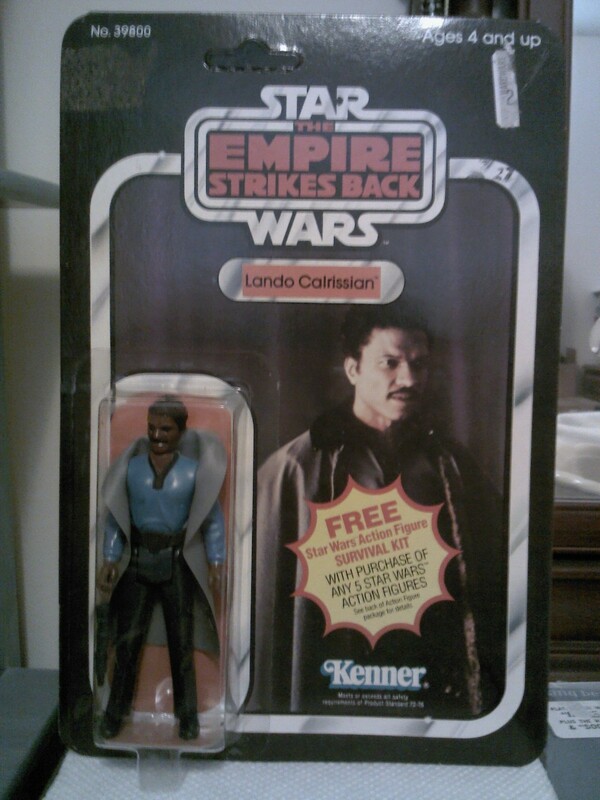 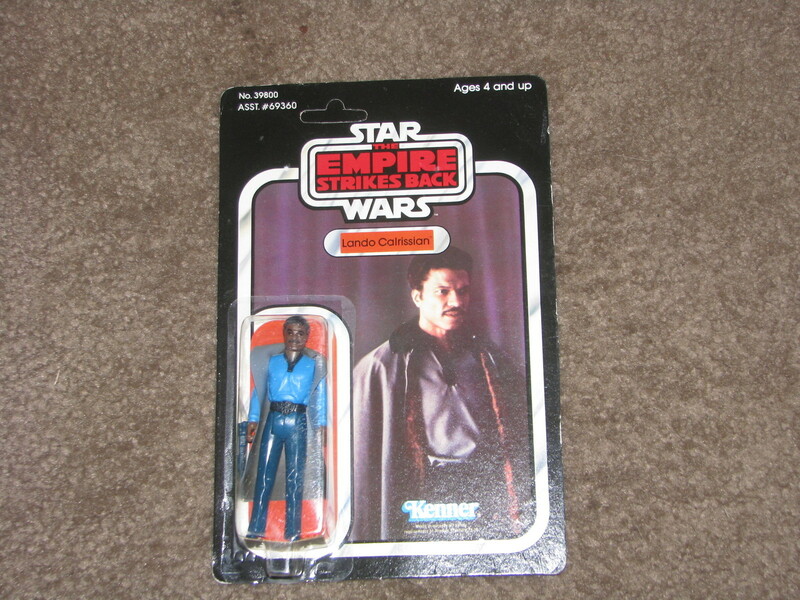 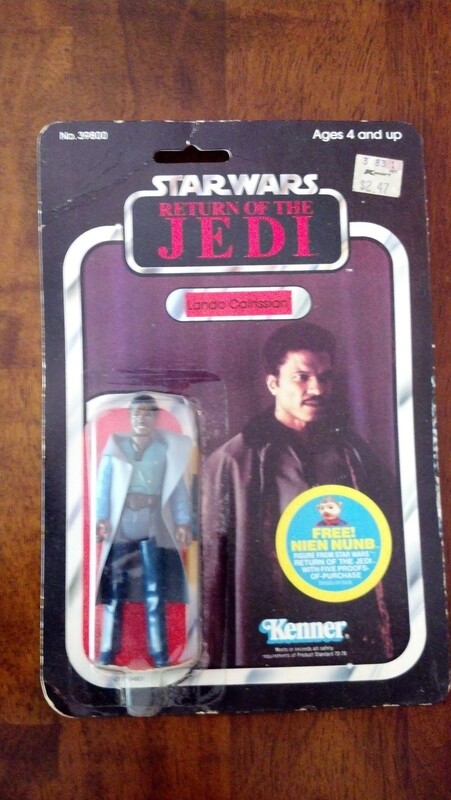 The plush line was an extension for Kenner to try and reach a new demographic with the series. 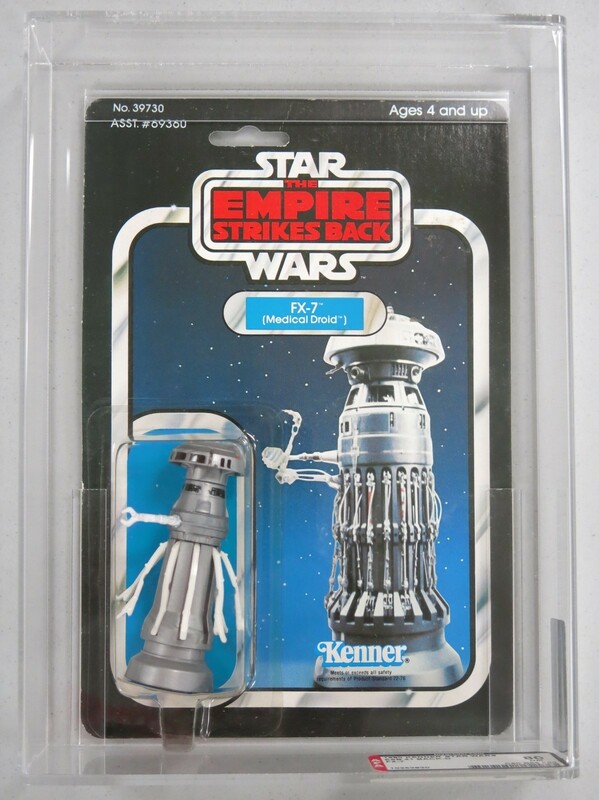 The line was however not as successful as initially hoped, and thus a lot of overstock made it into the collectors market and made these items fairly common. 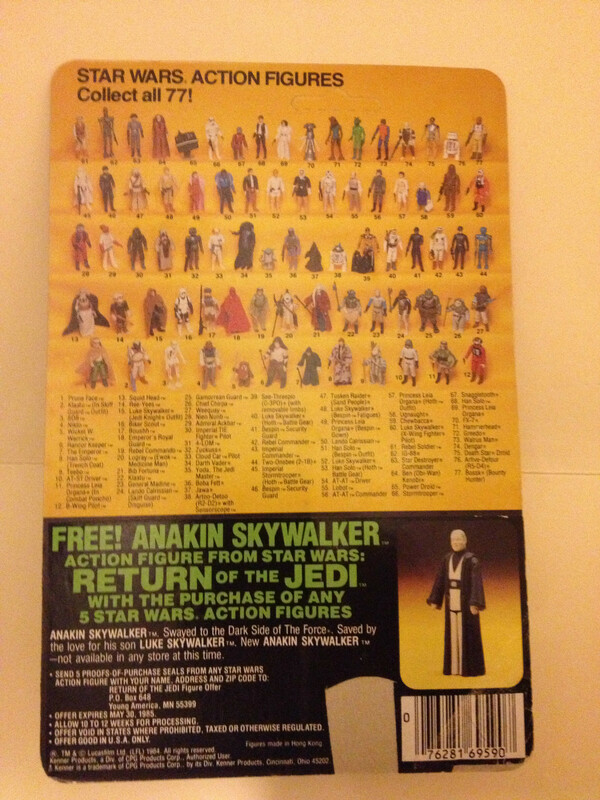 Unloved items for sure, but worthy of mentioning here. 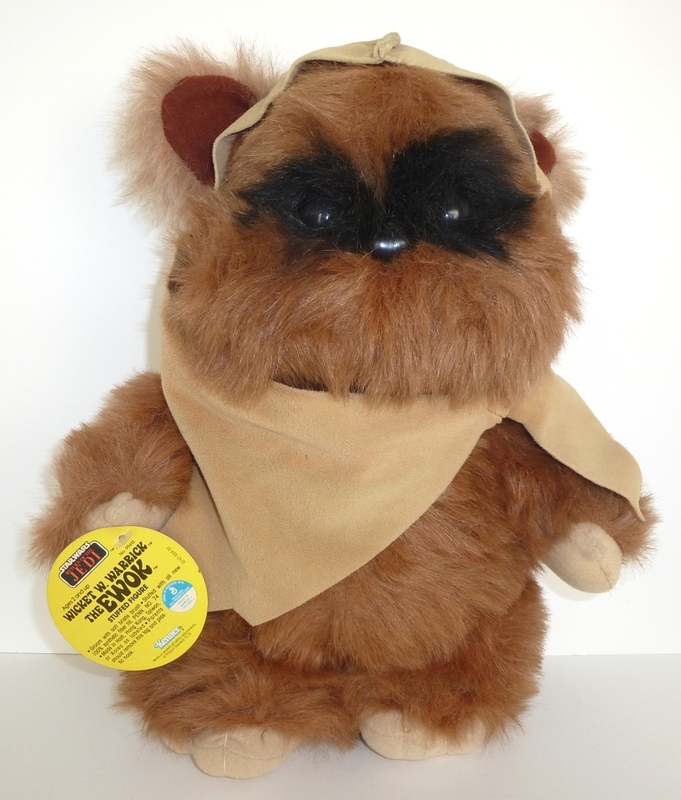 Proof Sheet – Plush Line Tags – $130 – ROTJ Proof Sheet – Ewok Plush Tags One of my personal favorites from this past Summer is the Ewok Plush Line Proof Sheet. 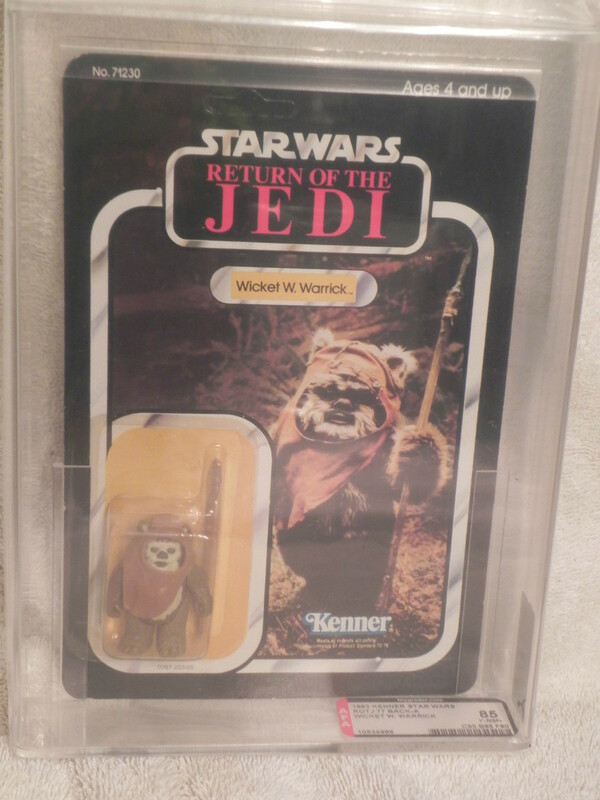 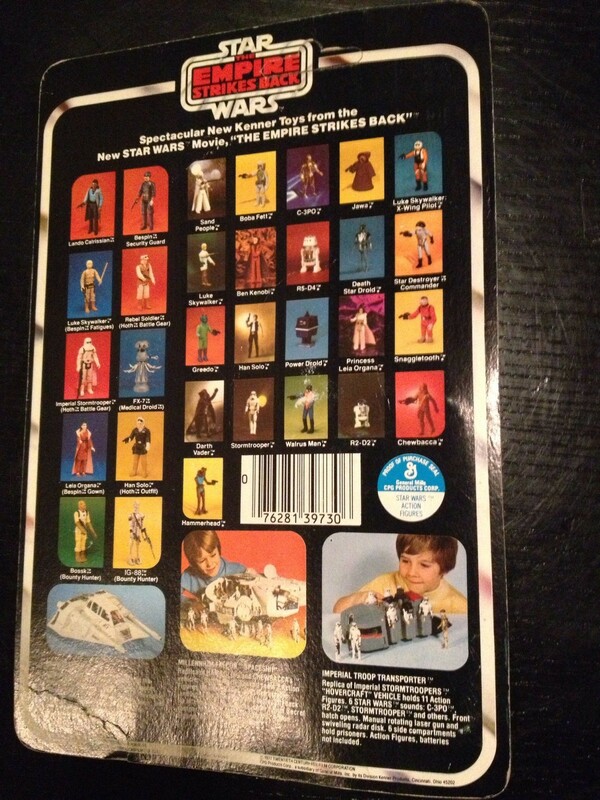 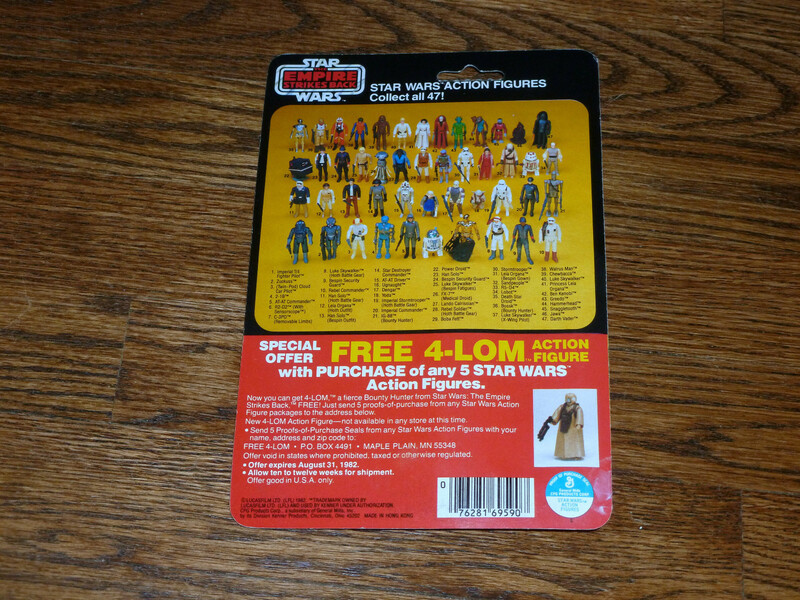 Featuring the tags for several of the Ewok Figures, this has a unique factor to it that I think embodies a lot of key Kenner Vintage line elements. 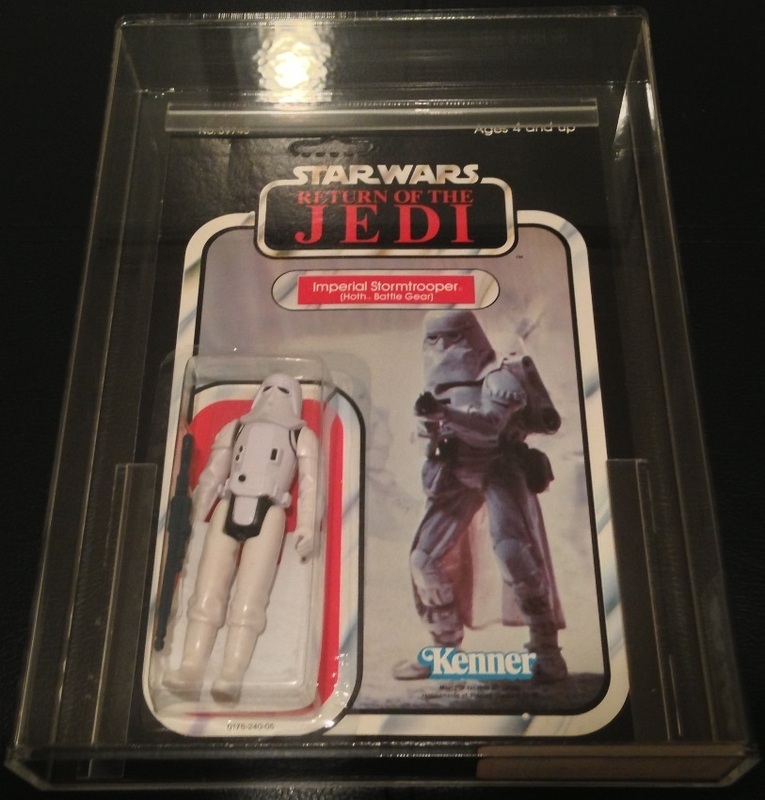 That about does it for this update on the ROTJ line and how well it sold this past summer, we hope you enjoy the deep dive. 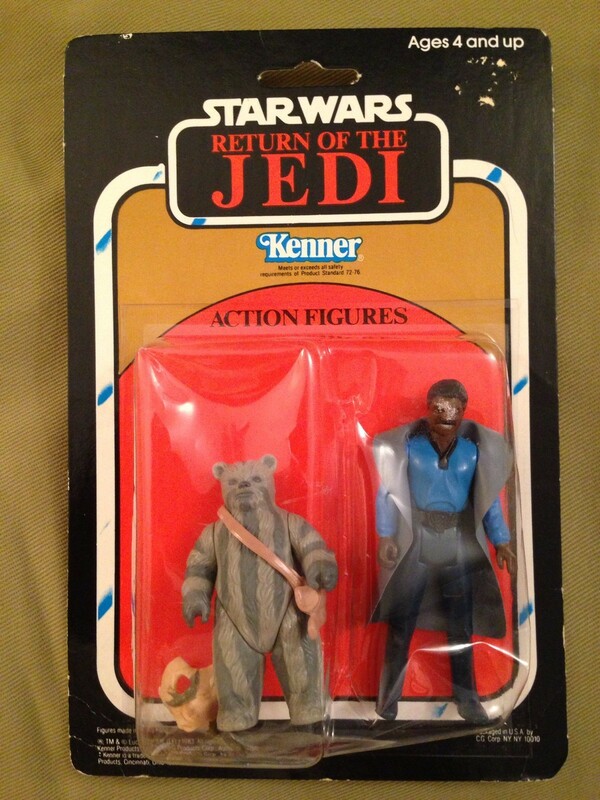 Until next time, Wampa Wampa! 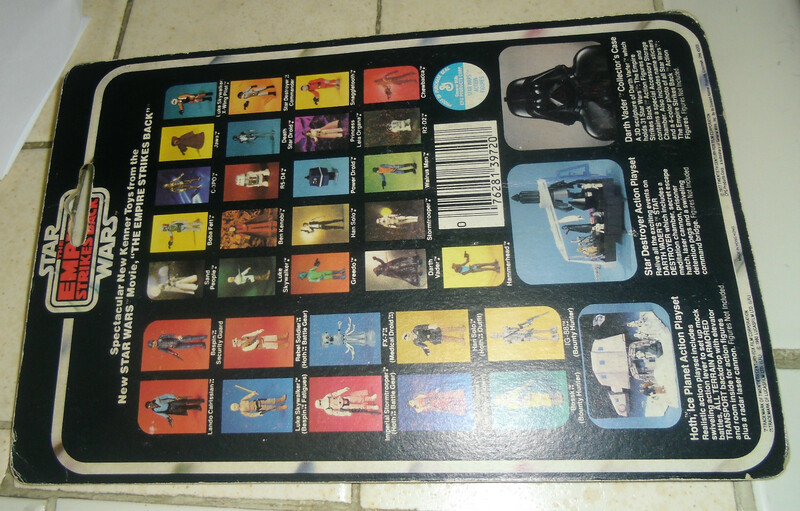 It is funny to notice all the variations to these cards as I compile these monthly updates for the ‘chivecast (yes Skye I like the original name for the podcast). 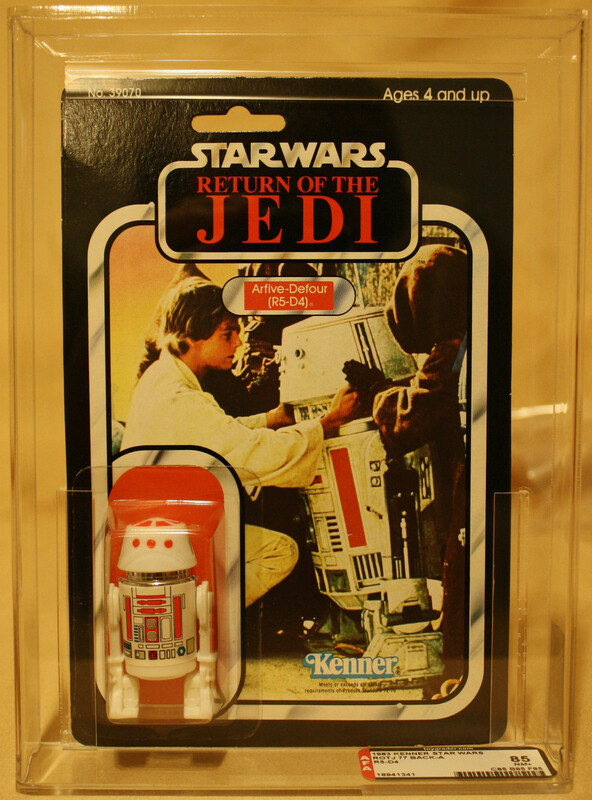 It seems Kenner believed that the toy buying public knew who FX-7 was by the time they got into the late ESB cards, with “(Medical Droid)” dropped from his name plate. 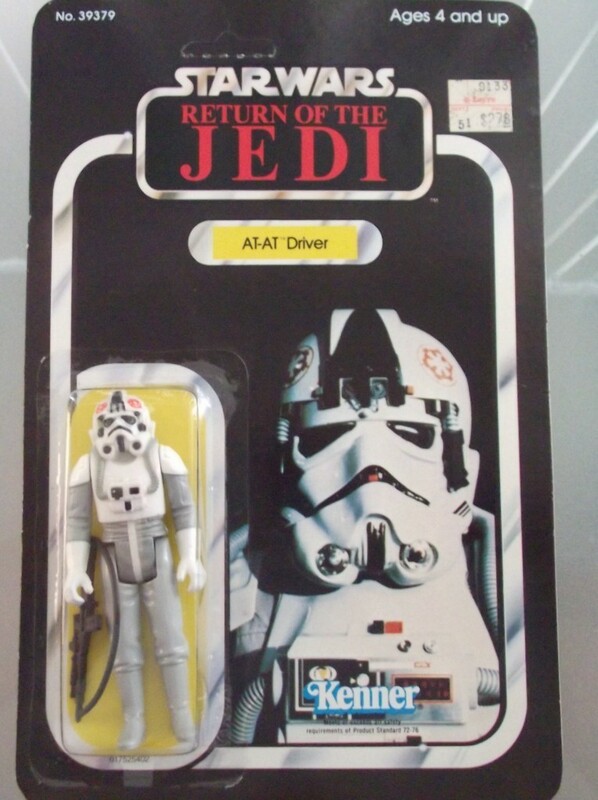 I suppose back in 1981/2 he was the most famous Medical Droid out there!! 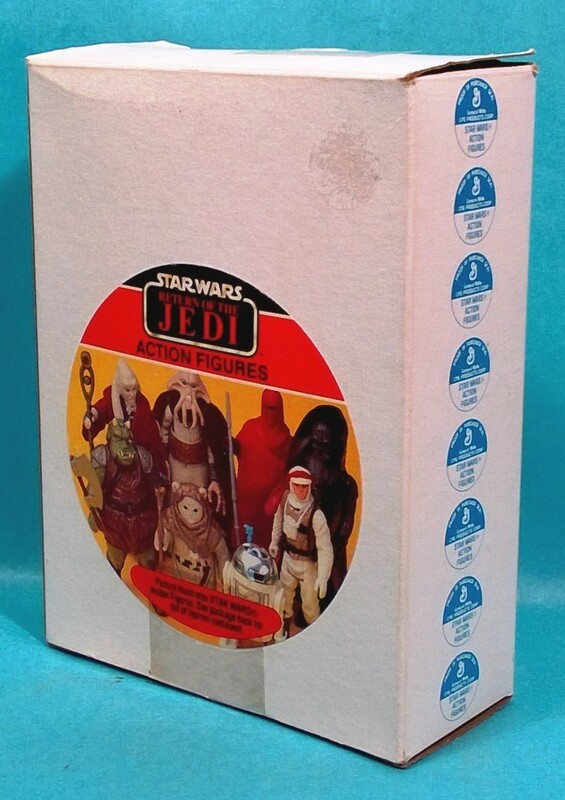 I wasn’t sure how this run would go, but again I’m surprised that there was a good aray of cards across the whole line that changed hands over eBay in recent months. 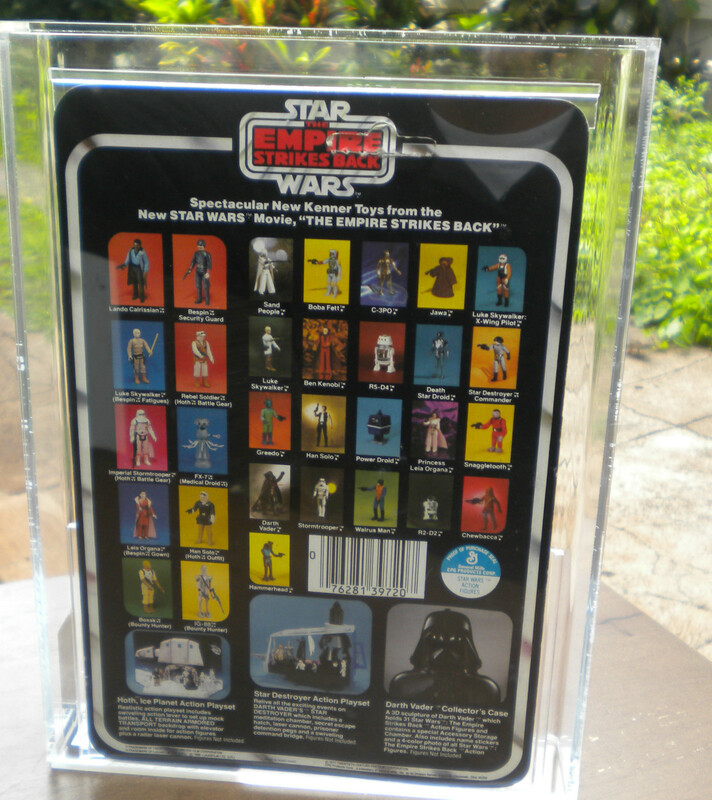 I’m actually chasing a decent 31 back to round off a full set of the 10 ESB characters released on the 31 backs. 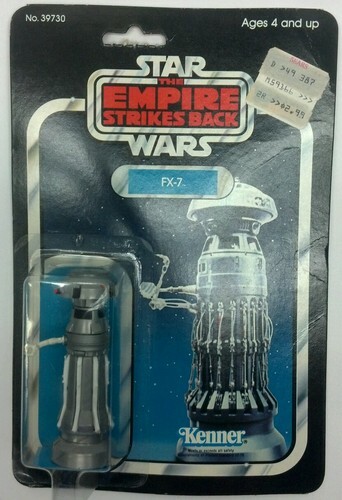 The FX-7 in this lot was a 31 Back. 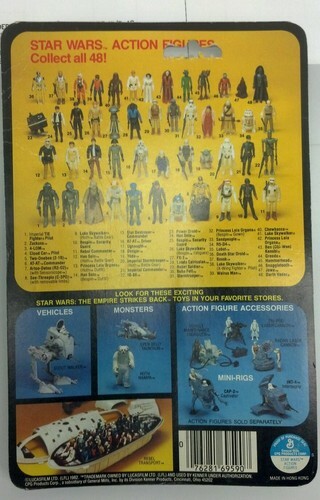 Lots and lots of 31 back examples in my data for the period. 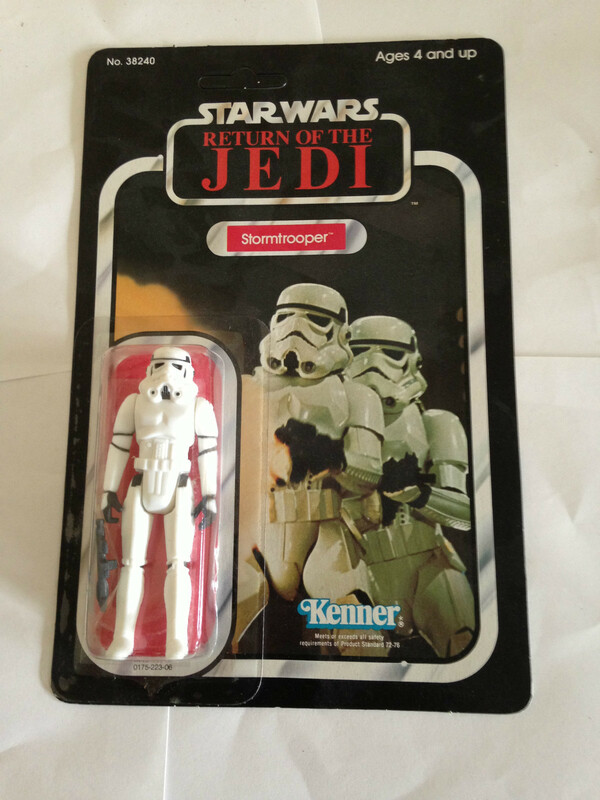 I even managed to find the same figure which was then resold 6 weeks later. 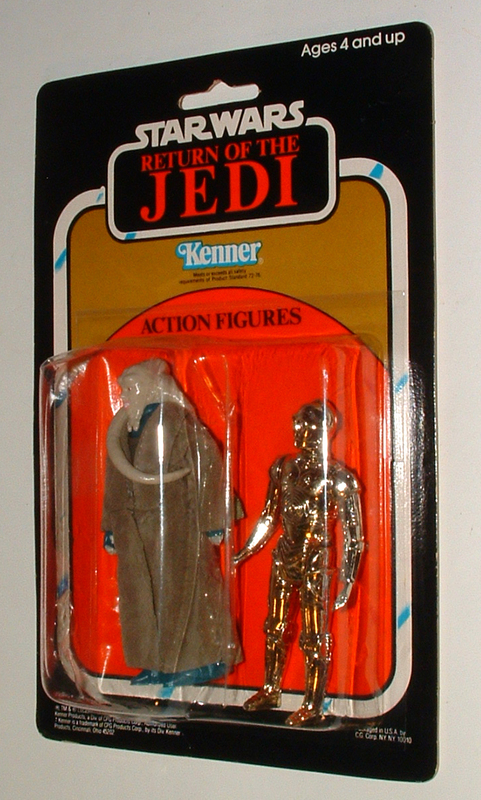 That figure in question achieved a much higher price second time around – which goes to show the vagaries of our so called ‘market’. 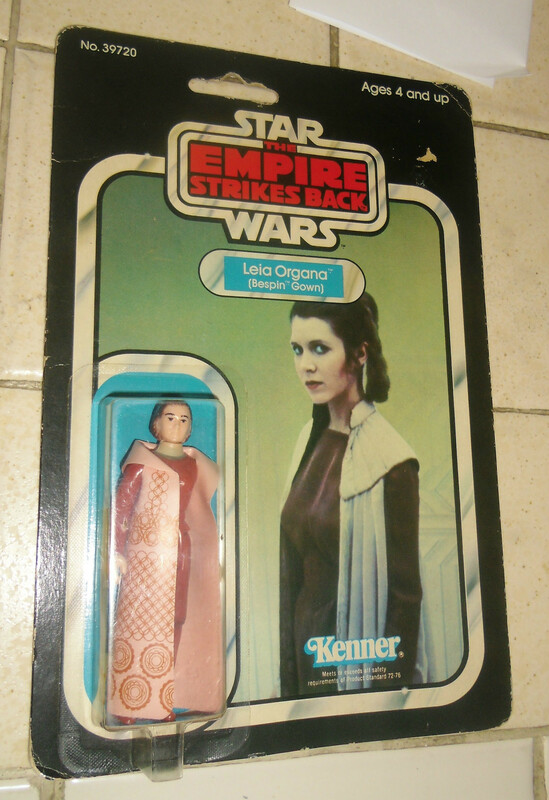 After the 31 back, things got a little rarer for Leia, couldn’t find any EB with the Survival Kit offer or the Ackbar offer (at this point there is no doubt a Leia focus collector yelling at me about why I can’t enunciate which figures are rare or other wise for Leia).